February 20, 2019: USPTO Weather-Related Closing The USPTO was closed on Wednesday, February 20, 2019 which is considered a "Federal holiday within the District of Columbia" under 35 USC § 21. Accordingly, where a 3-month 1.704(b) applicant response deadline falls on this date, the effective 3-month deadline for determining any PTA reduction is extended until Thursday, February 21, 2019. See ArQule v. Kappos, 793 F.Supp.2d 214 (D.D.C. 2011); MPEP § 2732. We have updated our calculator to automatically consider this closing in analyzing PTA rules when the Apply ArQule v. Kappos option (on by default) is selected on the Apply Term Rules tab. If you have questions, please contact us via e-mail to Support@PatentTerm.com. January 23, 2019: Federal Circuit Reverses PTA Reduction Exceeding Applicant Delay [Updated] Today, in Supernus v. Iancu, 2017-1357 (Fed. Cir. 2019), the US Court of Appeals for the Federal Circuit held that the USPTO exceeded its statutory authority by imposing a 646 day PTA reduction in US Patent No. 8,747,897 ("the '897 patent") for patentee's submission of an IDS after filing an RCE. The Court held that the PTA reduction went beyond the actual period during which the applicant failed to undertake reasonable efforts to conclude prosecution and thus exceeded the limitations set by the PTA Statute. The period of adjustment of the term of a patent ... shall be reduced by a period equal to the period of time during which the applicant failed to engage in reasonable efforts to conclude prosecution of the application. The Director shall prescribe regulations establishing the circumstances that constitute a failure of an applicant to engage in reasonable efforts to conclude processing or examination of an application. The USPTO rationale for this rule is that an applicant submitting an IDS after filing an RCE interferes with the USPTO’s ability to process an application because the examiner may be forced to go back and review the application again. The reduction can be avoided, however, if the IDS is accompanied by a Rule 1.704(d) 30-day safe harbor statement. We agree with Supernus that there were no efforts that it could have taken in the period of time during the preceding 546 days ... beginning with the filing of the RCE/IDS on February 22, 2011, and ending on the date of the EPO notification, August 21, 2012. Nor does the USPTO contend that Supernus could have undertaken any "reasonable efforts" during the 546-day time period to conclude prosecution. To the contrary, the facts indicate that there was no action Supernus could have taken to advance prosecution of the patent during the 546-day period, particularly because the EPO notice of opposition did not yet exist. ... Here, the USPTO's interpretation of the statute would unfairly penalize applicants, fail to incentivize applicants not to delay, and fail to protect applicants' full patent terms. The USPTO’s additional 546-day assessment as applicant delay is contrary to the plain meaning of the statute because the 646-day total reduction is not equal to a period of time during which Supernus failed to engage in reasonable efforts to conclude prosecution of the '897 patent. The USPTO's interpretation of the PTA statute applied in these circumstances exceeds the statutory limitations for PTA reduction and therefore, the USPTO actions are "in excess of statutory ... authority." Slip Op. at 18 (citation omitted). Gilead simply did not address the precondition—failure to engage in reasonable efforts—at issue here.... Gilead focused on whether the statute required the applicant’s failure to take reasonable efforts to have resulted in actual delay, as opposed to the potential to cause delay, to count towards reduction of PTA.... The precise question in this case is whether the USPTO may reduce PTA by a period that exceeds the "time during which the applicant failed to engage in reasonable efforts to conclude prosecution." 35 USC 154(b)(2)(C)(i). Gilead did not decide that question. The Supernus holding is important for patentees as it makes clear the USPTO is only authorized to reduce PTA for applicant delay equal to, and not exceeding, periods during which the applicant failed to engage in reasonable efforts to conclude prosecution. Sometimes, in particular prosecution scenarios, Rule 1.704 PTA reductions can produce unfair term penalties. Supernus should help patentees seek correction in these circumstances. The above overview is general in nature. Please see the Federal Circuit Opinion for complete details. In addition, further rules and guidance may be issued by the USPTO. Patentees are advised to recheck PTA calculations in light of Supernus to determine if any 37 CFR 1.704(c)(8) IDS reductions (or any other Rule 1.704 PTA reductions) exceed the actual applicant delay and to seek correction in appropriate cases. We will be updating our calculator with rule warnings on this issue, and to provide an updated rule on the Apply Term Rules tab. If you need assistance or have questions, please contact us via e-mail to Support@PatentTerm.com. January 14, 2019: USPTO Weather-Related Closing The USPTO was closed on Monday, January 14, 2019 which is considered a "Federal holiday within the District of Columbia" under 35 USC § 21. Accordingly, where a 3-month 1.704(b) applicant response deadline falls on this date, the effective 3-month deadline for determining any PTA reduction is extended until Tuesday, January 15, 2019. See ArQule v. Kappos, 793 F.Supp.2d 214 (D.D.C. 2011); MPEP § 2732. We have updated our calculator to automatically consider this closing in analyzing PTA rules when the Apply ArQule v. Kappos option (on by default) is selected on the Apply Term Rules tab. If you have questions, please contact us via e-mail to Support@PatentTerm.com. December 24, 2018: USPTO Holiday Closing The USPTO was closed on Monday, December 24, 2018 and Tuesday, December 25, 2018, which are considered "Federal holiday[s] within the District of Columbia" under 35 USC § 21. Accordingly, where a 3-month 1.704(b) applicant response deadline falls on these days, the effective 3-month deadline for determining any PTA reduction is extended until Wednesday, December 26, 2018. See ArQule v. Kappos, 793 F.Supp.2d 214 (D.D.C. 2011); MPEP § 2732. We have updated our calculator to automatically consider this closing in analyzing PTA rules when the Apply ArQule v. Kappos option (on by default) is selected on the Apply Term Rules tab. If you have questions, please contact us via e-mail to Support@PatentTerm.com. December 05, 2018: USPTO Closing Affects PTA In view of the National Day of Mourning, the USPTO was closed on Wednesday, December 5, 2018, which will be considered a "Federal holiday within the District of Columbia" under 35 USC § 21. Accordingly, where a 3-month 1.704(b) applicant response deadline falls on this date, the effective 3-month deadline for determining any PTA reduction is extended to Thursday, December 6, 2018. See ArQule v. Kappos, 793 F.Supp.2d 214 (D.D.C. 2011); MPEP § 2732. If an applicant files an Information Disclosure Statement (IDS) at certain times during prosecution, the filing may be considered applicant delay generating a PTA reduction. See 37 CFR 1.704(c)(6), (8), (9), (10), and (12). Common examples include filing an IDS after replying to an Office action or after a notice of allowance. Id. In appropriate circumstances, applicants can avoid this PTA reduction by filing the IDS accompanied by a 30-day Safe Harbor Statement under 37 CFR 1.704(d). Where the sole reason for contesting a USPTO PTA determination is the USPTO’s failure to recognize a timely Safe Harbor Statement under 37 CFR 1.704(d), a patentee may now request recalculation by submitting Form PTO/SB/134 in lieu of an Application for PTA under 37 CFR 1.705(b). The form must be filed within the 1.705(b) time limit, extendable under 37 CFR 1.136(a) by paying an extension of time fee. While the Interim Procedure waives the fee under 37 CFR 1.705(b)(1), any extension of time fee must still be paid. To aid in recognizing compliant Safe Harbor Statements, the USPTO has created Form PTO/SB/133. Applicants who submit Form PTO/SB/133 with an IDS will be considered to be making a proper Safe Harbor Statement, and the filing will be reflected in the file record. While use of Form PTO/SB/133 is not required, it is very strongly recommended to ensure Safe Harbor Statements are properly considered in prospective USPTO PTA calculations. As the USPTO develops its next generation information technology (IT) systems, it plans to modify its PTA computer program to recognize when Form PTO/SB/133 has been filed and thereby perform PTA calculations accounting for compliant Safe Harbor Statements. This should eliminate the need to file an Application for PTA under 37 CFR 1.705(b) or a Form PTO/SB/134 request concerning this issue. Accordingly, once the USPTO updates its PTA computer program and provides notice to the public, the Interim Procedure will be discontinued. When the USPTO receives a Form PTO/SB/134 request for recalculation, the Office of Petitions will manually review the PTA calculation under 37 CFR 1.702 through 1.704 (note that these rules cover all USPTO and applicant delay). The patentee will be given one opportunity to respond to the recalculation within two months (non-extendable) of the recalculation mail date. If the patentee fails to respond to the recalculation, the USPTO will sua sponte issue a certificate of correction if needed to correct the PTA printed on the patent. If the patentee responds to the recalculation by requesting changes not related to the Safe Harbor Statement, the patentee must comply with the requirements of 37 CFR 1.705(b)(1) and (2). If the patentee files a timely response and the USPTO maintains its recalculation, the USPTO will issue a decision confirming its recalculation pursuant to 35 USC 154(b)(3)(B)(ii), and this decision is the appealable Director’s decision under 35 USC 154(b)(4). The USPTO’s initial PTA recalculation under the Interim Procedure, however, is not the appealable Director’s decision under 35 USC 154(b)(4). The above overview is general in nature. Please see 83 FR 55102 (Nov. 2, 2018), Form PTO/SB/133, and Form PTO/SB/134 for complete details. When calculating PTA, patentees are advised to manually check Information Disclosure Statement filings for Safe Harbor Statements and seek correction in appropriate cases. In our calculator, users can indicate a Safe Harbor Statement using the appropriate checkbox on the Apply Term Rules tab. If you need assistance or have questions, please contact us via e-mail to Support@PatentTerm.com. April 26, 2018: EDVA Upholds USPTO B-Delay Calculation In Mayo Clinic v. Iancu, 1:17-cv-1153 (E.D. Va. 2018), the US District Court for the Eastern District of Virginia granted summary judgment upholding a USPTO PTA determination of B-Delay. B-Delay is a type of PTA under 35 USC 154(b)(1)(B) accruing if the USPTO fails to issue a patent within three years. B-Delay does not include inter alia "any time consumed by continued examination of the application requested by the applicant under section 132(b)" or "any time consumed by a [derivation or interference] proceeding under section 135(a)". 35 USC 154(b)(1)(B)(i) and (ii). In Mayo, per its usual practice, the USPTO determined the entire period from an RCE filing until the mailing of a notice of allowance to be "time consumed by continued examination" excluded from B-Delay. See 37 CFR 1.703(b)(1). In contrast, Mayo asserted that "continued examination" ended earlier when an interference was declared in its application. Mayo argued that a declaration of interference is analogous to allowance as claims are otherwise "deemed allowable" by the examiner before the interference is declared. Since the interference proceeding was separately excluded from B-Delay per 35 USC 154(b)(1)(B)(ii), left at issue was whether the time after termination of the interference until the notice of allowance should have been excluded from B-Delay. In the end, Mayo's arguments fail because Federal Circuit precedent makes clear that "time consumed by continued examination of the application requested by the applicant" includes time up until "allowance"--that is, when the notice of allowance is mailed, prosecution is closed, and further examination on the merits does not occur absent a special reopening. Novartis, 740 F.3d at 602. A declaration of interference is not allowance; after interference proceedings conclude, jurisdiction automatically returns to the examiner, and the examiner is required to conduct additional examination by updating prior art searches. As such, prosecution remains open at this point, further examination is routine, not exceptional, and this time is properly considered "time consumed by continued examination of the application requested by the applicant" pursuant to § 154(b)(1)(B). The above summary is general in nature. Please see the District Court Opinion for complete details. If you need assistance or have questions, please contact us via e-mail to Support@PatentTerm.com. March 12, 2018: EDVA Upholds USPTO PTA Reduction for Applicant Delay [Updated] In Intra-Cellular Therapies, Inc. v. Matal, 1:17-cv-00776 (E.D. Va. 2018), the US District Court for the Eastern District of Virginia granted summary judgment upholding the USPTO's PTA reduction for applicant's late response to a final Office action. The period of adjustment of the term of a patent ... shall be reduced by a period equal to the period of time during which the applicant failed to engage in reasonable efforts to conclude prosecution of the application.... [A]n applicant shall be deemed to have failed to engage in reasonable efforts to conclude processing or examination of an application for the cumulative total of any periods of time in excess of 3 months that are taken to respond to a notice from the Office making any rejection, objection, argument, or other request, measuring such 3- month period from the date the notice was given or mailed to the applicant. April 17, 2013 Final Office Action Rejects or objects to all outstanding claims. July 17, 2013 Amendment and Response after Final Amends claims, presents arguments, and adds one new claim. July 26, 2013 Advisory Action Indicates submission overcomes some, but not all, rejections and objections; new claim would be allowable if submitted separately; and the time period continues to run from mailing date of final rejection. Enters amendments for purposes of appeal. August 7, 2013 Amendment and Response to Advisory Action Cancels, further amends, and adds claims overcoming all outstanding objections and rejections. August 20, 2013 Notice of Allowance Allows remaining claims. The USPTO assessed 21 days of applicant delay, concluding that applicant's first submission on July 17, 2013 was not a proper reply under 37 CFR 1.113(c) and thus applicant had failed to engage in reasonable efforts to conclude prosecution until its second submission on August 7, 2013. In contrast, the applicant argued the USPTO erred in equating a "reply" under 37 CFR 1.704(b) with a "reply" under 37 CFR 1.113, and that no PTA reduction is warranted because its first submission substantially advanced prosecution and amounted to "reasonable efforts to conclude prosecution." Applicant further argued that, by entering the Amendment, the USPTO effectively conceded the first response was valid. [T]he PTA calculation explicitly relies in part on whether a "reply" complies with § 1.113(c), and thus a "reply" under § 1.704(b) is therefore inextricably linked with § 1.113(c), and a "reply" under § 1.704(b) must meet the requirements of § 1.113(c).... Looking then to § 1.113(c), that regulation states that a "[r]eply to a final rejection or action must include cancellation of, or appeal from the rejection of, each rejected claim. If any claim stands allowed, the reply to a final rejection or action must comply with any requirements or objections as to form." 37 CFR § 1.113(c). In other words, a proper reply under § 1.113(c) to a final Office action must resolve all rejections or objections, otherwise it does not stop the three-month clock for assessing applicant delay. Because Plaintiff's July 17, 2013 submission did not cancel all of the rejected claims or remove all of the outstanding objections identified in the final Office action, the USPTO determined that the submission was not a proper reply under § 1.113(c), and was therefore not a "reply" as defined in § 1.703(a)(3) and as incorporated into § 1.704(b). The USPTO determined that Plaintiff's July 17, 2013 submission was not a valid reply under § 1.703(b), and therefore constituted a "fail[ure] to engage in reasonable efforts to conclude processing or examination" under § 1.704(b). This Court finds that the USPTO's determination was based on a permissible construction of the relevant statutes, and therefore should be afforded deference under Chevron. Furthermore, this Court finds that the USPTO did not concede that the July 17, 2013 submission was a valid reply in compliance with § 1.113(c) by entering the amendments presented in the submission. Accordingly, the USPTO's Final Decision that the July 17, 2013 submission did not stop the clock under § 1.703(b) for accruing applicant delay was not arbitrary and capricious, and should be affirmed. The above overview is general in nature. Please see the District Court opinion for complete details. If you have questions, please contact us via e-mail to Support@PatentTerm.com. February 07, 2018: Federal Circuit Upholds USPTO A-Delay Calculation [Updated] In Actelion v. Matal, 2017-1238 (Fed. Cir. 2018), the US Court of Appeals for the Federal Circuit upheld the USPTO's PTA calculation of A-Delay for the subject patent. This ruling validates the USPTO's long-standing implementation of several technical aspects of 35 USC 154(b)(1)(A)(i) (14-month USPTO first action deadline) as applied to national stage applications. [I]f the issue of an original patent is delayed due to the failure of the [USPTO] to (i) provide at least one of the notifications under section 132 of this title or a notice of allowance under section 151 of this title not later than 14 months after … the date on which an international application fulfilled the requirements of section 371 … the term of the patent shall be extended 1 day for each day after the end of the period … until the action … is taken. [I]f the issue of an original patent is delayed due to the failure of the [USPTO] to (i) provide at least one of the notifications under section 132 or a notice of allowance under section 151 not later than 14 months after … the date of commencement of the national stage under section 371 in an international application … the term of the patent shall be extended 1 day for each day after the end of the period … until the action … is taken. Although the parties disputed which version of 35 USC 154(b)(1)(A)(i)(II) applies to the subject patent, the Actelion Court did not reach this issue, finding the same result under both versions. Nonetheless, confirmation of the USPTO's interpretation of the TCA applicability date is an important issue and may arise in future litigation. See our discussion below on January 15, 2013 and April 3, 2013 for more information. … Using the PTO form may be optional, and, as Actelion contends, there may be other ways to communicate to the PTO an "express request" pursuant to § 371(f). However, neither the fact that using the PTO forms may be optional nor the availability of other § 371(f)-compliant means of making an express request excuses an applicant's failure to make its intention clear…. Even viewed most favorably to Actelion, the casual "solicits early examination" language with no reference to § 371(f), the PCT, or the national stage, when combined with the unchecked box 3 of its completed PTO Form 1390, was, if not an express election not to commence the national stage early, at least an inconsistent or ambivalent request. We therefore find no error in the PTO's determination that Actelion's submission of PTO Form 1390 with box 3 unchecked, and its precatory solicitation remark having no operative consequence, did not amount to an express request pursuant to § 371(f). Slip Op. at 12 (citation omitted). Where an applicant does not expressly request commencement of the national stage under 35 USC 371(f), an application may fulfill the requirements of 371(c) prior to the national stage commencing under 371(b) (i.e., upon the expiration of the 30 month time limit). For its application, Actelion argued the earlier 371(c) fulfillment date, rather than the later 371(b) commencement date, constitutes the date it "fulfilled the requirements of section 371" for purposes of pre-TCA 35 USC 154(b)(1)(A)(i)(II), thus starting the USPTO's 14-month deadline earlier. We agree with the PTO that, under either the pre- or post-TCA version of § 154(b)(1)(A)(i)(II), the A Delay calculation must be based on the date on which the entirety of § 371 is complied with, including § 371(b) and (f). As such, we conclude that under either pre- or post-TCA law, Actelion was required to comply with the "express request" provision of § 371(f) if it wished to commence the national stage before the expiration date provided in § 371(b). Actelion's "no holiday exception" argument, similar to its pre-TCA statutory argument, is premised on the assumption that any time period of inaction that is not attributable to the applicant should inure to the applicant's benefit. As such, Actelion emphasizes its alleged lack of fault during the time periods in question. However, by the same logic, inaction on a holiday is also not attributable to the PTO. Although the PTA statutes do serve a remedial purpose of restoring patent term lost during prosecution of an application, they only restore "undue delays in patent examination caused by the PTO" as provided by Congress. Pfizer, 811 F.3d at 468 (emphasis added). We find no error in the PTO's determination that the national stage for the '675 patent did not commence until the next workday after the 30-month date that fell on a federal holiday. The above overview is general in nature. Please see the Federal Circuit opinion for complete details. If you have questions, please contact us via e-mail to Support@PatentTerm.com. January 19, 2018: EDVA Overturns USPTO B-Delay Calculation In ARIAD Pharma v. Matal, 1:17-cv-733 (E.D. Va. 2018), the US District Court for the Eastern District of Virginia granted summary judgment overturning a USPTO PTA determination of B-Delay. The ruling is predicated on a somewhat uncommon prosecution circumstance--a withdrawn abandonment after an RCE filing--and thus its effect may be limited. B-Delay is a type of PTA under 35 USC 154(b)(1)(B) accruing if the USPTO fails to issue a patent within three years. B-Delay does not include inter alia "any time consumed by continued examination of the application requested by the applicant under section 132(b)." 35 USC 154(b)(1)(B)(i). In the ARIAD prosecution, in response to a final rejection, the applicant filed an RCE, which normally begins the B-Delay exclusion for time consumed by continued examination. See 37 CFR 1.703(b)(1). Instead of acting on the RCE, however, the USPTO erroneously issued a notice of abandonment suggesting that no response had been filed. The applicant then petitioned and the USPTO withdrew the abandonment since Office records indicated a reply had in fact been received. The central dispute in this case is whether the PTO's exclusion of time during which the PTO erroneously considered ARIAD's application to be abandoned comports with the statutory requirement that "B Delay" should exclude only "time consumed by continued examination. "… [I]t is important to note that Congress did not use the phrase--"time after the applicant filed a request for continued examination" or "time attributable to a request for continued examination" in the statutory text. Instead, Congress chose to draft the provision as "any time consumed by continued examination of the application requested by the applicant." …The ordinary [Webster's Dictionary] meaning of "consumed by" is "used in the course of." Time cannot possibly be used in the course of continued examination where, as here, the PTO erroneously determines the application is abandoned and does not believe it has even received an RCE.... Accordingly, the PTO's exclusion of time when the PTO erroneously considered an application abandoned from ARIAD's "B Delay" calculation is inconsistent with the plain text of the statute. ... Put simply, in computing “time consumed by continued examination,” the PTO should not include time when the PTO was plainly not conducting continued examination, but instead negligently concluded that the patent application had been abandoned. Thus, plaintiff is entitled to judgment as a matter of law. Slip Op. at 7 (footnote and citations omitted). The above summary is general in nature. Please see the District Court opinion for complete details. At this time, to apply this holding in our PTA calculator, you should manually adjust PTA rules on the Apply Term Rules tab by, e.g., moving the Exclusion for Continued Examination rule. If you need assistance or have questions, please contact us via e-mail to Support@PatentTerm.com. December 05, 2017: Oral Argument Heard in Supernus Federal Circuit Appeal Yesterday, Judges Dyk, Schall, and Reyna of the US Court of Appeals for the Federal Circuit heard oral argument on Supernus's appeal of the EDVA decision upholding the USPTO’s 646 day PTA reduction under 37 CFR 1.704(c)(8) for patentee's filing of a supplemental paper, an IDS, after filing an RCE. A recording of the oral argument is available on the Federal Circuit website. Briefs and further case details are available below. The panel was clearly troubled by the USPTO charging the patentee with failing to engage in reasonable efforts to conclude prosecution for an extended period in which patentee was waiting for an Office action, had no options to act, and did nothing improper. Nonetheless Judge Schall questioned the practicality of the USPTO making case-by-case reasonableness determinations versus a bright line rule for all cases. If the Court invalidates the portion of the regulation delineating the magnitude of the PTA reduction, however, we believe no such individualized determinations will be required. Instead, the USPTO would likely revise its regulation (and update its computerized algorithm) to set a PTA reduction more closely corresponding to the actual delay. Some possible revisions are discussed below. We expect a ruling will be issued in the first quarter of 2018. In the meantime, patentees are advised to consider the possibility of a future rule change in light of this appeal, and to recheck USPTO-calculated PTA and seek correction in appropriate cases. The above is general in nature. Please see the briefs and legal authorities for complete details. If you have questions, please contact us via e-mail to Support@PatentTerm.com. Please see our discussion below for more details on this case. Patentees are advised to consider the possibility of a future rule change in light of this appeal, and to recheck USPTO-calculated PTA and seek correction in appropriate cases. The deadline to request reconsideration of PTA under 37 CFR 1.705(b) is within 2 months from the patent grant date, extendable by an additional 5 months pursuant to Rule 1.136(a). The 35 USC 154(b)(4)(A) deadline to seek correction by civil action is within 180 days after the date of the Director’s decision on applicant’s request for reconsideration. The above is general in nature. Please see the briefs and legal authorities for complete details. If you have questions, please contact us via e-mail to Support@PatentTerm.com. November 15, 2016: EDVA Upholds Unfair PTA Penalty for IDS after RCE [Updated] In Supernus v. Lee, 1:16-cv-342 (E.D. Va. 2016), the US District Court for the Eastern District of Virginia granted summary judgment upholding the USPTO’s 646 day PTA reduction for patentee’s filing of an IDS after an RCE. While some aspects of the disputed PTA rule were recently upheld by the Federal Circuit in Gilead Sciences, Inc. v. Lee, 778 F.3d 1341 (Fed. Cir. 2015), the Supernus facts more clearly demonstrate a logical flaw in the portion of the USPTO regulation delineating the magnitude of the PTA reduction, offering the Federal Circuit an opportunity to revisit the regulation on appeal. The general rationale is that an IDS, when filed after an applicant reply, may delay prosecution since the examiner may already be working on a response, and may be forced to go back and re-review the application, while still trying to meet timeliness obligations under 35 USC 154. Per the regulation, the PTA reduction can be avoided if the applicant provides a Rule 1.704(d) 30-day safe harbor statement, but Supernus did not so its IDS was subject to the rule. As specified in Rule 1.704(c)(8), the reduction runs from the from the RCE filing date (applicant's initial reply) until the IDS filing date (applicant's supplemental reply or other paper), a period of 646 days as shown above. This 646 day reduction period, however, fails to corresponds to the "period of time during which the applicant failed to engage in reasonable efforts to conclude prosecution" as required by 35 USC 154(b)(2)(C)(i). 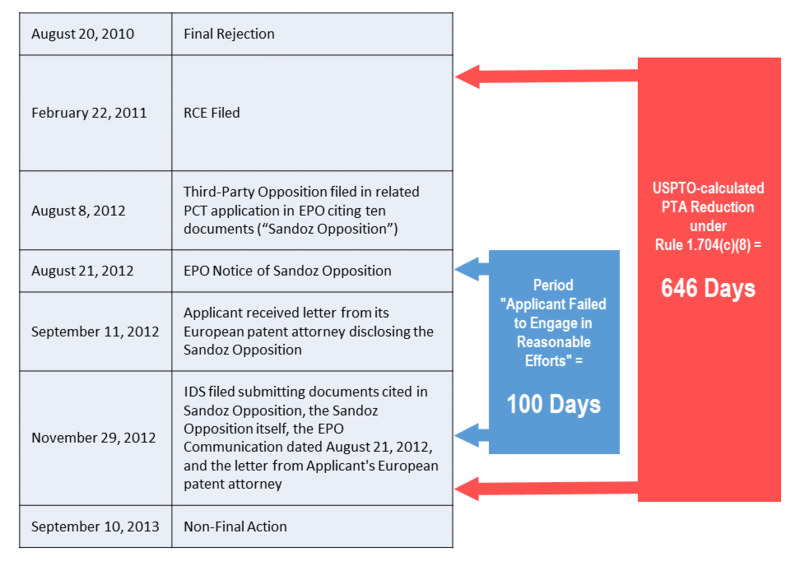 The USPTO begins charging Supernus with failing to engage in reasonable efforts for filing an IDS based on the Sandoz Opposition 18 months before the Sandoz Opposition even came into existence. Even assuming arguendo that Supernus should have filed its IDS on the same day of the Sandoz Opposition, it did so only 113 days later (only 83 days after the 1.704(d) safe harbor deadline). A failure to engage period of 646 days, including time before the subject Opposition even existed, is illogical. Moreover, the notion that Supernus caused 646 days of prosecution delay by filing an IDS is unfair. How can an IDS cause that much delay? 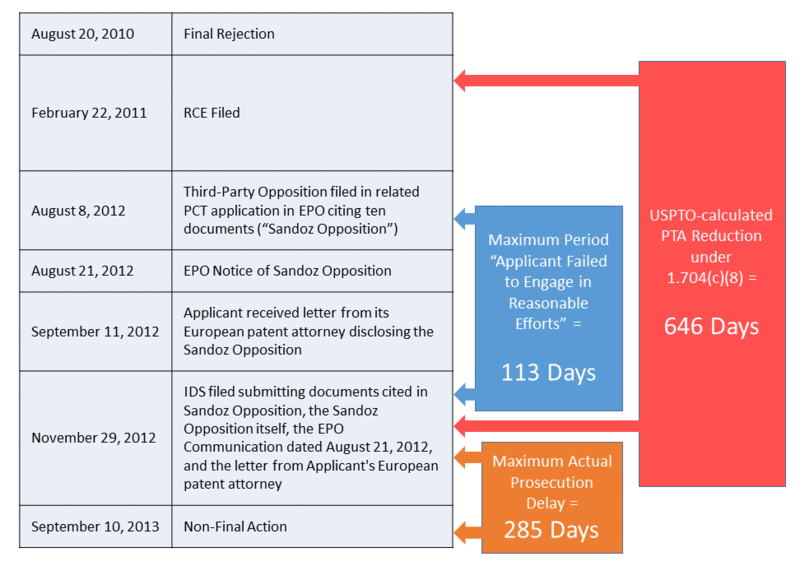 Most of the delay is actually attributable to the USPTO's 21-month failure to act even before the IDS was filed. Even assuming arguendo that the examiner was about to issue an Office action on the same day as the IDS, but pulled and reworked the Office action because of the IDS, the maximum actual prosecution delay is 285 days, the period after the IDS as shown above. Of course, if it takes an examiner 285 days to process an IDS, much of that delay is rightfully attributable to the USPTO, not the applicant. The PTA statute does not require the PTO to make any sort of particularized determination of PTA, and instead directs the PTO to promulgate rules of general applicability that address the circumstances that will lead to a deduction of PTA. § 1.704(c)(8) is one of these rules. The Federal Circuit in Gilead upheld the reasonableness of the PTO's interpretation of 35 USC § 154 by finding that § 1.704(c)(8) is not arbitrary, capricious, or otherwise not in accordance with law. Accordingly, because § 1.704(c)(8) applies squarely to this case, Plaintiff's claim must fail as a matter of law. This ignores the larger issue, however, that the 1.704(c)(8) reduction period is not properly drafted to correspond to the "period of time during which the applicant failed to engage in reasonable efforts" and ignores delays caused by the USPTO. Although not addressed in Supernus, note that the USPTO is charged with "establishing the circumstances that constitute a failure of an applicant to engage in reasonable efforts" (e.g., filing an IDS after a reply), not defining the magnitude of the reduction (i.e., "period of time during which the applicant failed to engage in reasonable efforts") associated with such circumstances. Compare 35 USC 154(b)(2)(C)(iii) with 35 USC 154(b)(2)(C)(i). A fairer PTA reduction would perhaps run from the IDS filing date until the next Office action or allowance, and would definitely be limited to a maximum penalty such as four months. The same maximum is reflected in other USPTO-defined applicant delays, see 37 CFR 1.704(c)(3), (6), (9), and (10), and would account for the fact that excessive processing time is rightfully attributable to the USPTO. October 31, 2016: EDVA Upholds USPTO’s Implementation of 14-Month Rule for National Stage Applications In Actelion v. Lee, 1:16-cv-304 (E.D. Va. 2016), the US District Court for the Eastern District of Virginia granted summary judgment upholding the USPTO’s PTA calculation of A-Delay for the subject patent. This ruling validates the USPTO's implementation of several technical aspects of both the current and previous versions of 35 USC 154(b)(1)(A)(i) as applied to national stage applications. The parties disputed which version of 35 USC 154(b)(1)(A)(i)(II) applies to the subject patent, granted in 2014, but having a national stage commencement date in 2012, and a PCT filing date in 2010. Per its interpretation of the AIA TCA, the USPTO asserts the amendment applies since the patent was granted on or after January 14, 2013. See Interim Final Rule, Revisions to Patent Term Adjustment, 78 FR 19416 (Apr.1, 2013); Final Rule, Revisions To Implement the Patent Term Adjustment Provisions of the Leahy-Smith America Invents Act Technical Corrections Act, 79 FR 27755 (May 15, 2014). Since the Actelion Court held that the PTA is the same under both versions, however, it did not reach this issue. Nonetheless, confirmation of the USPTO's interpretation of the AIA TCA applicability date is an important point and may arise in future litigation. See our discussion below on January 15, 2013 and April 3, 2013 for more information. Where an applicant does not expressly request commencement of the national stage under 35 USC 371(f), an application may fulfill the requirements of 371(c) prior to the national stage commencing under 371(b) (i.e., upon the expiration of the 30 month time limit). For its application, Actelion argued the 371(c) fulfillment date, rather than the later 371(b) commencement date, constitutes the date it "fulfilled the requirements of section 371" for purposes of pre-AIA TCA 35 USC 154(b)(1)(A)(i)(II), thus starting the USPTO's 14-month deadline. As [the USPTO] convincingly argues, [Actelion's] characterization of the pre-AIA TCA A Delay calculation would incoherently permit a filer to begin accruing A-Delay on the day of filing the application in compliance with only § 371(c) based on the PTO's purported delay in reviewing the application, even if the filer refused early examination under § 371(f), because the PTO would be prohibited by statute from reviewing the application until the end of the 30 month period as required by § 371(b). While [Actelion] completed in advance the actions required under PCT Art. 22(1) as a necessary condition to  USC § 371(b); the statutory scheme contemplates that a filer need not take an action until the expiration date. Because a filer can take actions on the expiration date, the PTO must be available to receive and take action on such filings-which is not possible on a weekend or federal holiday-precisely the consideration which [35 USC] § 21(b) is intended to ameliorate. Accordingly, [the USPTO’s] decision to apply the weekend/holiday exception is consistent with the interpretation of similar statutory provisions and is not a clear error of judgment. [P]laintiff's challenge to the PTO's B-Delay calculation must be dismissed because [35 USC] 154(b)(1)(B)(i) makes clear that, without exception, the calculation of B-Delay does not include "any time consumed by continued examination of the application requested by the applicant under [§] 132(b)." ... [T]here is no statutory or constitutional basis for plaintiff's claim that the PTO erred in its PTA calculation ... of B-Delay ...."
This conclusion is consistent with the recent Singhal v. Lee holding discussed below. It is also consistent with how the USPTO, and most applicants, typically calculate PTA. Remaining in the Maass action is a separate challenge, the details of which were not reached by the Court, concerning the amount of applicant delay associated with the filing of a supplemental amendment and applicant delay accrued during continued examination. Under a joint motion, these issues have been remanded to the USPTO for reconsideration. April 26, 2016: Printing Error Causes USPTO to Understate PTA For some patents issuing on March 22, 2016, the USPTO printed the incorrect PTA value on the face of the patent, understating PTA by 1 to 7 days compared to the USPTO-calculated value shown in the PAIR system. Since the PTA value printed on the patent is the USPTO’s "official" determination of PTA, affected patentees should seek correction to ensure the proper term in appropriate cases. See MPEP 2733 at 2700-39; Final Rule, Revisions To Implement the Patent Term Adjustment Provisions of the Leahy-Smith America Invents Act Technical Corrections Act, 79 FR 27755 at 27757 (May 15, 2014). If the patentee considers the PTA displayed in PAIR to be correct, patentee may request a certificate of correction under 37 CFR 1.322 within two months of the notification letter (no extension of time is available). No fee is required. If the patentee believes the correct PTA is an amount different than in PAIR or printed on the patent, patentee may file a Request for Reconsideration of PTA under 37 CFR 1.705 within two months of patent issue date, extendable by an additional five months pursuant to Rule 1.136(a). Alternatively, if the patentee believes he is entitled to less PTA than printed on the patent, patentee may disclose the error in a letter to the USPTO that will be placed into the file without comment. See MPEP 2733. See the example notification letter for details. When auditing PTA, patentees are reminded to check PTA vis-à-vis the "official" USPTO PTA determination as printed on the patent (in addition to the calculation details available in PAIR). If you have questions, please contact us via e-mail to Support@PatentTerm.com. April 17, 2016: District Court Dismisses B-Delay PTA Challenge In Singhal v. Lee, 1:12-cv-00708 (E.D. Va. 2016), the US District Court for the Eastern District of Virginia dismissed a pro se challenge to the PTA statute defining B-Delay. Plaintiff's argument fails for at least two reasons: (1) the constitutional "void for vagueness" doctrine only applies to statutes that, unlike § 154, seek to prohibit conduct; and (2) § 154's use of "request for continued examination" especially when the provision includes a cross-reference to the statute creating the procedure itself is clearly comprehensible. The remaining arguments simply take issue with the policy judgment that Congress made in promulgating § 154. . . . Courts including the Federal Circuit in interpreting § 154 itself have repeatedly held that they lack authority to re-write a statute simply because a Plaintiff "believes that the delicate balance that Congress struck was erroneous, unwise, or somehow inequitable." Wyeth v. Kappos, 591 F.3d 1364, 1370-71 (Fed. Cir. 2008). Plaintiff has not identified any authority to the contrary. This dismissal is consistent with how the USPTO, and most applicants, typically calculate PTA. The above overview is general in nature. Please see the District Court opinion for complete details. If you have questions, please contact us via e-mail to Support@PatentTerm.com. January 26, 2016: USPTO Storm-Related Closing Affects PTA Due to weather conditions in the DC area, the USPTO was closed on Monday, January 25, 2016, and Tuesday, January 26, 2016. The USPTO will consider these days to be “Federal holiday[s] within the District of Columbia” under 35 USC § 21. Accordingly, where a 3-month 1.704(b) applicant response deadline falls on these dates (or on Saturday, January 23, 2016, or Sunday, January 24, 2016), the effective 3-month deadline for determining any PTA reduction is extended to Wednesday, January 27, 2016. See ArQule v. Kappos, 793 F.Supp.2d 214 (D.D.C. 2011); MPEP § 2732 (Ninth Edition, Revision 07.2015, Oct. 2015) at 2700-28. We have updated our calculator to automatically consider this closing in analyzing PTA rules when the Apply ArQule v. Kappos option is selected on the Apply Term Rules tab. If you have questions, please contact us via e-mail to Support@PatentTerm.com. January 22, 2016: Federal Circuit Upholds USPTO PTA Calculation [Updated] Today, in Pfizer v. Lee, 2015-1265 (Fed. Cir. 2016), a split panel of the US Court of Appeals for the Federal Circuit upheld the USPTO's determination that its restriction requirement, even though incomplete and subsequently withdrawn, constituted a notification under 35 USC § 132 for purposes of satisfying its 14-month first action PTA deadline under 35 USC § 154(b)(1)(A)(i). A-Delay is a type of PTA under 35 USC § 154(b)(1)(A) accruing if the USPTO fails to act by certain examination deadlines. The deadline at issue in Pfizer requires the USPTO to provide a Section 132 notification (e.g., a restriction requirement or office action), or a notice of allowance, within 14 months of the filing or national stage commencement date. See 35 USC § 154(b)(1)(A)(i). In the prosecution of the patent on appeal, the USPTO first provided an incomplete restriction requirement which omitted the classification of six dependent claims. Once informed of this deficiency by the Applicant, the Examiner acknowledged that the restriction was not complete, agreed to withdraw it, and issued a corrected restriction requirement. [T]he examiner’s initial restriction requirement satisfied the statutory notice requirement because it informed the applicant of “the broad statutory basis for [the rejection of] his claims.” Here, the examiner’s detailed descriptions of the 21 distinct invention groups outlined in the examiner’s initial restriction requirement were clear, providing sufficient information to which the applicants could have responded.… Indeed, the applicants never challenged the content of the invention groups defined by the examiner. And, significantly, the examiner’s defined invention groups remained identical between the two restriction requirements.… Viewed as a whole, the restriction requirement provided adequate grounds on which the applicants could “recogniz[e] and seek to counter the grounds for rejection.” Therefore, because the examiner clearly defined to the applicants the invention groups available for election and further prosecution, the applicants were placed on sufficient notice of the reasons for the examiner’s restriction requirement. [T]he applicants’ and examiner’s exchanges concerning the challenged restriction requirement were part of the typical “back and forth” process of patent prosecution. The underlying “purpose of PTA is to ‘compensate patent applicants for certain reductions in patent term that are not the fault of the applicant,’ not to guarantee the correctness of the agency’s every decision.” As explained above, because the initial restriction requirement placed the applicants on notice of “the broad statutory basis for [the rejection of their] claims,” the restriction requirement satisfied the notice requirement of Section 132. Thus, we conclude that Appellants’ alleged delay is not the type of error for which the Act was intended to compensate. Slip Op. at 10-16 (citations omitted). The Court distinguished situations where an independent claim is omitted from a restriction requirement, where an examiner revises the nature or description of the distinct inventions, and where an examiner sua sponte rescinds and replaces a restriction without explanation or prompting from the applicant. While not dispositive, such circumstances may support an argument that certain withdrawn actions do not satisfy the notice requirement of Section 132. Despite the PTO’s admission of its error, my colleagues propose that the applicant should have proceeded as if the incorrect restriction requirement were correct “because the initial restriction requirement placed the applicant on notice of ‘the broad statutory basis for [the rejection of] his claims,’ the restriction requirement satisfied the notice requirement of Section 132.” Thus the panel majority holds that this admitted PTO-caused delay must be treated as if it did not occur, although it necessarily delayed prosecution, for the applicant could not reliably elect which claims to prosecute when some claims had been omitted by the examiner. The issue is not whether the applicant could have guessed where among the 21 groups the examiner intended to put claims 75, 76, 103, 104, 105, and 106. Nor is the issue whether the error was harmless (the PTO does not argue that its error was harmless), for it is not disputed that the error delayed prosecution. The PTO does not argue that the prosecution could have proceeded in the absence of PTO correction of its failure to account for every claim. The issue is simply whether the delay that necessarily ensued is an “‘A’ Delay” subject to inclusion in the term adjustment. Rather than guess, the applicant is entitled to a complete Office action. See 37 C.F.R. § 1.104(b). Here, the PTO provided an incomplete action. The delay caused by such a scenario should not be charged against the patent applicant, nor should the applicant be prejudiced by the examiner’s error. The panel majority erroneously holds that term adjustment is not available because the applicant, not the PTO, spotted the PTO’s error. Whether the examiner’s actions “were outside the normal ‘give-and-take process’ of patent prosecution,” should not turn on who recognized the error. The statutory purpose is clear: when patent issuance is delayed because of proceedings that are not the fault of the applicant, the patent term is extended to compensate for the delay. My colleagues’ statutory interpretation and application are contrary to the letter and purpose of the law. I respectfully dissent. Slip Op. at 3-7 (citations omitted). Note that, in contrast to the PTA effect of USPTO conduct, where an applicant submits a reply having an omission, or supplements its reply (unless expressly requested by the Examiner), such actions will typically generate a PTA reduction. See 37 CFR 1.704(c)(7),(8). December 29, 2015: Emergency USPTO Closing Affects PTA Due to a major outage of many USPTO electronic systems, the USPTO will consider each day from Tuesday, December 22, 2015, to Thursday, December 24, 2015, to be a "Federal holiday within the District of Columbia" under 35 USC § 21. Accordingly, where a 3-month 1.704(b) applicant response deadline falls on one of these days, the effective 3-month deadline for determining any PTA reduction is extended to Monday, December 28, 2015. See ArQule v. Kappos, 793 F.Supp.2d 214 (D.D.C. 2011); MPEP § 2732 (Ninth Edition, Revision 07.2015, Oct. 2015) at 2700-28. Note that December 25, 26, and 27, 2015, are a Federal holiday, Saturday, and Sunday, respectively. We have updated our calculator to automatically consider this emergency closing in analyzing PTA rules when the Apply ArQule v. Kappos option is selected on the Apply Term Rules tab. If you have questions, please contact us via e-mail to Support@PatentTerm.com. See below for more detailed information on the impact of each of these PTA developments. The above highlights are general in nature. Please see the revised Chapter 2700 for complete details. If you have questions, please contact us via e-mail to Support@PatentTerm.com. July 03, 2015: Federal Circuit Rejects Retroactive PTA Recalculation under Wyeth In Daiichi Sankyo Co. v. Lee, 2014-1280 (Fed. Cir. 2015), the US Court of Appeals for the Federal Circuit rejected Daiichi's attempt to retroactively apply the holding of Wyeth after expiration of the 180-day civil review deadline set forth in 35 USC 154(b)(4)(A) (2006) (amended 2011). As detailed in prior posts below, in Wyeth v. Kappos, 591 F.3d 1364 (Fed. Cir. 2010), the Federal Circuit held that the USPTO was under-calculating PTA for many patents. In response, the USPTO created an expedited Optional Interim Procedure (now expired) for patentees to request PTA reconsideration under Wyeth without filing a petition under 37 CFR 1.705(d) or a district court action under 35 USC 154(b)(4)(A) (2006). The USPTO limited use of the procedure, however, to patents still eligible for civil review of PTA under 35 USC 154(b)(4)(A) (2006). Nonetheless, under several different legal theories, Daiichi contended that two of its older patents, issued outside of the 180-day deadline of 35 USC 154(b)(4)(A) (2006), should have been entitled to PTA recalculation under Wyeth. Regarding the [USPTO's] adoption of the 180-day period for administrative review, the government argues that this selection was logical because it lengthened the period for administrative review to match the period for seeking judicial review. Additionally, the government points to the abbreviated period of judicial review as evidence of Congress' intent that questions regarding patent term adjustments be "decided quickly and soon after the issuance of the patent." Hence, any extension of the period for administrative review beyond 180 days would be contrary to the statute. Finally, the government contends that to consider any recalculation request regardless of how long after issuance it was filed--as Daiichi claims is appropriate under 35 USC § 254--would run contrary to the PTO’s authority to adopt regulations governing the procedures for requesting reconsideration of patent term adjustments. Here, we agree with the government that the PTO has not erroneously interpreted the law. Rather, the agency acted within its discretion under the statute to “prescribe regulations establishing procedures for the . . . determination of patent term adjustments,” 35 USC § 154(b)(3), in adopting the 180-day period as part of the Interim Procedure. Slip Op. at 11 (citations omitted). An applicant dissatisfied with the Director’s decision on the applicant’s request for reconsideration under paragraph (3)(B)(ii) shall have exclusive remedy by a civil action against the Director filed in the United States District Court for the Eastern District of Virginia within 180 days after the date of the Director’s decision on the applicant’s request for reconsideration. Chapter 7 of title 5 shall apply to such action. Any final judgment resulting in a change to the period of adjustment of the patent term shall be served on the Director, and the Director shall thereafter alter the term of the patent to reflect such change. See below for more information on HR 6621. June 25, 2015: Federal Circuit Upholds PTA Calculation Today, in Mohsenzadeh v. Lee, 2014-1499 (Fed. Cir. 2015), the US Court of Appeals for the Federal Circuit upheld the USPTO's long-standing position that PTA accrued in a parent application does not carry over to a continuing application. The language of the provision of the patent term adjustment statute at issue, 35 USC § 154(b)(1)(A), clearly shows that Congress intended delay in the prosecution of an application to be restored to a single patent, the patent issuing directly from that application. In other words, the term of any patent arising from a continuing application is not restored for delay in the prosecution of the parent patent’s application. Of course, a patent issuing from a continuing application is still entitled to its own PTA based on delays occurring in its own prosecution. This ruling is consistent with how the USPTO, and most applicants, typically calculate PTA. See the Federal Circuit opinion for complete details. May 29, 2015: Crystal Anniversary of AIPA Patent Term Adjustment To restore fairness and proper incentives to inventors, the American Inventors Protection Act (AIPA) was enacted in 1999 to compensate for Patent Office examination delays. AIPA guaranteed that diligent applicants would always receive a patent term of no less than 17 years, sometimes considerably more, up to 20 years. Today marks the 15th anniversary of the applicability of AIPA Patent Term Adjustment. Original applications (other than for a design patent) are subject to AIPA Patent Term Adjustment if filed on or after May 29, 2000. March 20, 2015: PTA on Agenda at Next USPTO BCP Customer Partnership Meeting The USPTO has scheduled its next Biotechnology, Chemical and Pharmaceutical Customer Partnership (BCP) Meeting for April 7, 2015. The agenda includes a session on recent updates in Patent Term Adjustment (PTA) and Patent Term Extension (PTE) by Mary Till and Kery Fries of the USPTO Office of Patent Legal Administration. The registration deadline is April 3, 2015. Participants can attend in person or via webcast. Visit the event page for registration and more information. The amount of the reduction equals the number of days from the day after the mailing of the notice of allowance until the RCE filing date. For example, an RCE filed 45 days after the mailing of a notice of allowance, will generate a 45 day PTA reduction. See 37 CFR 1.704(d) for complete details. The new 37 CFR 1.704(c)(12) PTA reduction "applies only to applications in which a request for continued examination under 35 USC 132(b) and 37 CFR 1.114 is filed on or after March 10, 2015." 80 FR 1346 (Jan. 9, 2015). Based on this wording, arguably, the reduction may apply retroactively to older RCE's if a subsequent RCE is filed on or after March 10, 2015 in the same application. Most post-grant PTA audits will not immediately be impacted (until affected applications proceed to issuance). Practitioners should, however, consider the new PTA reduction and its safe harbor exemption in determining prosecution strategy. We have added a new rule in our calculator, RCE after Notice of Allowance, corresponding to the new 37 CFR 1.704(c)(12) PTA reduction. This rule can be added on the Apply Term Rules tab. The above description is general in nature, and the PTA effect in an individual patent will depend on the specifics of its prosecution. Please see the Final Rule for complete details. If you need assistance or have questions, please contact us via e-mail to Support@PatentTerm.com. February 26, 2015: Federal Circuit Upholds PTA Reduction Today, in Gilead Sciences, Inc. v. Lee, 2014-1159 (Fed. Cir. 2015), the US Court of Appeals for the Federal Circuit affirmed summary judgment upholding the USPTO's PTA reduction for applicant delay pursuant to 37 CFR 1.704(c)(8). The specific conduct at issue was the applicant's filing of a supplemental IDS after a response to a restriction requirement had been filed. [T]his court finds that a reasonable interpretation of the statute is that Congress intended to sanction not only applicant conduct or behavior that result in actual delay, but also those having the potential to result in delay irrespective of whether such delay actually occurred. After considering this and several related arguments, the Court ultimately rejected Gilead’s contention that the regulation is overbroad and found the USPTO’s construction of the statute to be reasonable. Note that practitioners may sometimes, in appropriate circumstances, avoid a PTA reduction by filing an IDS concurrently with or before a reply to an Office action, or by including a statement under the safe harbor provision of 37 CFR 1.704(d). Further note that Rule 1.704(c)(8) is not limited to IDS filings, but also applies to certain other applicant papers such as a supplemental reply or petition. The above description is general in nature, and the PTA effect in an individual patent will depend on the specifics of its prosecution. Please see the Gilead opinion for complete details. If you have questions, please contact us via e-mail to Support@PatentTerm.com. January 15, 2015: Calculator Update We have updated our PTA calculator in accordance with the recent revision to 37 CFR 1.703(b)(1) set forth in Changes to Patent Term Adjustment in view of the Federal Circuit Decision in Novartis v. Lee, 80 FR 1346 (Jan. 9, 2015), which is effective immediately for all patents subject to AIPA patent term adjustment. See our prior post for more information on this Final Rule. This calculator update affects one rule in our system, Exclusion for Continued Examination. For this rule, we have updated its description, changed its default behavior to count the last day of the exclusion period as an exclusion day (changeable by user election), and changed the exclusion ending event title to "Notice of Allowance." See the Apply Term Rules tab to view the new version in your applications. Importantly, for existing applications, existing rule assignments are not automatically changed unless you rerun the Rule Assignment Engine by (i) clicking QuickStart on the Applications tab; or (ii) clicking Apply Draft Rules on the Apply Term Rules tab. Of course, as always, you must carefully review draft rule assignments and alter, add, or delete rules to perform the PTA calculation in accordance with your legal interpretations. In addition, we will be adding a new rule corresponding to the new PTA reduction in 37 CFR 1.704(c)(12) prior to its effective date of March 10, 2015. If you need assistance or have questions, please contact us via e-mail to Support@PatentTerm.com. This formulation, which simply excludes the period from each RCE to the next notice of allowance, is less complex than the Proposed Rule, and does not exclude periods where the USPTO reopens prosecution after allowance. The day of allowance, however, is excluded from B-Delay, which is arguably contrary to Novartis and will likely be the subject of future litigation (see discussion of Proposed Rule below and comments submitted in response to Proposed Rule). This rule change is effective immediately and applies, prospectively and retroactively, to all patents subject to AIPA patent term adjustment. According to the Notice, the USPTO's PTA-calculation algorithm has already been updated for PTA determinations in patents issued on or after October 7, 2014. Patentees are advised to recheck PTA in appropriate cases and seek correction as necessary. The reduction provides no exception for cases in which there is no B-Delay, or less B-Delay than the reduction. Thus, based on its stated purpose, Rule 1.704(c)(12) will over penalize some patentees and, for a limited number of cases, provide a shorter patent term than was available prior to Novartis. It is possible some patentees will challenge the reduction, arguing that a post allowance RCE/IDS submission does not constitute a "failure of the applicant to engage in reasonable efforts to conclude processing or examination." See amended 37 CFR 1.704(d) for complete details. The new 37 CFR 1.704(c)(12) PTA reduction applies only to applications in which an RCE is filed on or after March 10, 2015. The revision to 37 CFR 1.704(c)(10) applies to all patents subject to AIPA patent term adjustment. Since the revision is consistent with current USPTO practice, however, no effect on PTA calculations is likely. (14) letters related to government interests (e.g., those between NASA and the Office). The Office no longer considers submission of a written (or other type of) status inquiry, request for refund, or an inventor’s oath or declaration to be a failure to engage in reasonable efforts to conclude processing and examination of the application under § 1.704(c)(10) due to the changes that have been brought about by the electronic filing and processing of patent applications. (8) an information disclosure statement not accompanied by a statement in compliance with § 1.704(d). 80 FR at 1354 (emphasis, line breaks, and bullets added; some listed items may merely reflect current USPTO practice). Since the Notice discussion modifies whether some applicant papers are subject to 37 CFR 1.704(c)(10), it may immediately impact PTA calculations for a limited number of patents. For affected cases, patentees are advised to recheck PTA and seek correction as appropriate. The above description is general in nature, and the PTA effect in an individual patent will depend on the specifics of its prosecution. Please see the Final Rule for complete details. We are in the process of updating our calculator in accordance with the Final Rule. In the meantime, when analyzing cases, you will need to manually adjust PTA rules on the Apply Term Rules tab to account for changes. If you need assistance or have questions, please contact us via e-mail to Support@PatentTerm.com. January 09, 2015: USPTO Issues Final Rules on Novartis Today, the USPTO issued a Final Rule, Changes to Patent Term Adjustment in view of the Federal Circuit Decision in Novartis v. Lee, 80 FR 1346 (Jan. 9, 2015), setting forth final rule changes in light of the Federal Circuit decision in Novartis AG v. Lee, 740 F.3d 593 (Fed. Cir. 2014). We are currently reviewing this Final Rule and will add a post to highlight its changes. Please check back. We will be updating our calculator in accordance the Final Rule. In the meantime, when analyzing cases, you will need to manually adjust PTA rules on the Apply Term Rules tab to account for this change. If you need assistance or have questions, please contact us via e-mail to Support@PatentTerm.com. December 17, 2014: USPTO Processed Nearly 10,000 Patent Term Petitions in FY 2014 According to the recent FY 2014 USPTO Performance and Accountability Report, the USPTO issued actions on 9,957 Patent Term Adjustment/Extension petitions in FY 2014, a ten-fold increase from the previous year. Most actions, however, were likely computer-generated recalculations under the optional procedure (now expired) allowing some patentees to request PTA recalculation in view of the AIA Technical Corrections Act without a fee or Rule 1.705 petition. See below for more information on the optional procedure (now expired) and the AIA Technical Corrections Act. October 08, 2014: USPTO Updates PTA Algorithm for Novartis For at least some patents issuing on or after October 7, 2014, we have observed that the USPTO has apparently changed its PTA calculation algorithm to consider the effect of Novartis AG v. Lee, 740 F.3d 593 (Fed. Cir. 2014). This USPTO update, however, seems premature since the USPTO has not yet issued final rules on Novartis, and its Notice of proposed rulemaking was the subject of considerable commentary on the proper Novartis interpretation. Until the USPTO issues final rules on Novartis and the USPTO algorithm change is fully scrutinized, patentees are advised to carefully recheck USPTO-calculated PTA in light of Novartis and seek correction in appropriate cases. If you have questions, please contact us via e-mail to Support@PatentTerm.com. September 09, 2014: Comments Published on Proposed Rules The USPTO has published comments submitted in response to the Notice of proposed rulemaking, Changes to Patent Term Adjustment in View of the Federal Circuit Decision in Novartis v. Lee, 79 FR 34681 (June 18, 2014). Commenters include AIPLA, IPO, and PhRMA. See below for more information on this important Notice of proposed rulemaking. June 18, 2014: USPTO Issues Proposed Rules on Novartis [Updated] The USPTO has issued a Notice of proposed rulemaking, Changes to Patent Term Adjustment in View of the Federal Circuit Decision in Novartis v. Lee, 79 FR 34681 (June 18, 2014). The Notice sets forth several proposed rule changes in light of the recent Federal Circuit decision in Novartis AG v. Lee, 740 F.3d 593 (Fed. Cir. 2014). Written comments concerning the Notice must be received by the USPTO on or before August 18, 2014. [W]e agree with Novartis on its second § 154(b)(1)(B) issue. Novartis argues that the “time consumed by continued examination” should be limited to the time before allowance, as long as no later examination actually occurs. In contrast, the PTO contends that any time up until the patent issues, even after allowance, should be excluded from the adjustment awarded to the patentee. We reject the PTO’s view that the time after allowance, until issuance, is “time consumed by continued examination” and so is excluded from adjustments given to the patentee. Such time from allowance to issuance undisputedly would count toward the PTO’s three-year allotment in a case not involving a continued examination. There is no basis for distinguishing a continued examination case. [A]llowance-to-issuance time is not to be distinguished according to whether there is a continued examination in a prosecution. Either way such time is plainly attributable to the PTO. The language of “examination” used in § 154(b)(1)(B) reflects that underlying principle. An “examination” presumptively ends at allowance, when prosecution is closed and there is no further examination on the merits in the absence of a special reopening.... The common-sense understanding of “time consumed by continued examination,” 35 USC § 154(b)(1)(B)(i), is time up to allowance, but not later, unless examination on the merits resumes. The PTO identifies several circumstances in which affirmative action is taken to resume examination after allowance, perhaps based on new information submitted by applicants in fulfillment of their continuing duty to disclose information material to patentability, 37 CFR § 1.56. See, e.g., BlackLight Power, Inc. v. Rogan, 295 F.3d 1269, 1273-74 (Fed. Cir. 2002) (even after payment of the issue fee, but before issuance, PTO officials can take “extraordinary action to withdraw a patent from issue” and “return the . . . application to examination”); 37 CFR § 1.313(a) (applicant may request resumption of examination). But such circumstances are exceptional, and an appropriate adjustment can be made when they occur. For none of the three applications at issue does the PTO identify any “continued examination of the application” that occurred after the notice of allowance was mailed. The possible existence of these exceptional cases does not support a general rule excluding time between allowance and issuance. In the present case, time after allowance was not time caused by the continued examination. Because the PTO applied the contrary view in calculating the patent term adjustment for the [patents at issue], those calculations must be corrected. Accordingly, where prosecution in an application is reopened after allowance, an RCE would generate non-contiguous periods excluded from B-Delay (e.g., the period from an RCE to a first allowance, and the period from a subsequent Office action reopening prosecution to the next allowance). Moreover, regardless of whether prosecution is reopened, the formula excludes the day of allowance, which is arguably contrary to Novartis ("[A]llowance-to-issuance time is not to be distinguished according to whether there is a continued examination in a prosecution.... The common-sense understanding of “time consumed by continued examination ... is time up to allowance, but not later, unless examination on the merits resumes.") (emphasis added). The reduction provides no exception for cases in which there is no B-Delay--patentees would still be subject to a PTA reduction. The Notice does not state whether or not the new penalty would apply retroactively. The Notice indicates that the USPTO has not yet modified its PTA calculation algorithm for Novartis. Thus, patentees are advised to recheck USPTO-calculated PTA and seek correction in appropriate cases. In deciding Rule 1.705 requests for PTA reconsideration, the USPTO manually calculates PTA and thus does take into account the Novartis decision. The above description is general in nature, and the potential PTA effect in an individual patent will depend on the specifics of its prosecution and the final implementation of the proposed changes. Please see the Notice of proposed rulemaking for complete details. If you have questions, please contact us via e-mail to Support@PatentTerm.com. (1) For patents granted on or after January 14, 2013 on US national stage applications under 35 USC 371, the USPTO 14-month first action requirement under 35 USC 154(b)(1)(A)(i)(II) was changed. Under revised Rules 1.702(a)(1) and 1.703(a)(1), the USPTO must issue a first action within 14 months of commencement of the national stage under section 371(b) or (f), rather than upon fulfillment of the 371 requirements. Since the USPTO's 14-month deadline starts earlier in some national stage applications, this change is beneficial to patentees and may substantially increase PTA in some national stage cases. (2) For all patents granted on or after January 14, 2013, the PTA indicated on the patent itself is the USPTO's "official" notification of its PTA determination, and is the only determination for which an applicant may seek reconsideration under revised Rule 1.705. The deadline to seek such reconsideration is two months from the issue date, extendable by an additional five months pursuant to Rule 1.136(a). The USPTO will discontinue providing an indication of the PTA with the notice of allowance. (3) If an applicant needs to seek reinstatement of PTA where, in spite of all due care, it was unable to respond within 3 months (e.g., more time is necessary to obtain test data for an affidavit or declaration), the request must be filed prior to issuance. See 35 USC 154(b)(3)(C); 37 CFR 1.705(c). Such reinstatement request is not common, however. For USPTO calculation errors with respect to a three-month applicant response deadline, the notice clarifies that requesting reconsideration is by way of a Rule 1.705(b) petition. See 79 FR at 27759. (4) According to the notice, the USPTO software performing PTA calculations has finally been modified, and PTA calculations for patents issuing on national stage applications on or after May 20, 2014 will finally take into account the revision per item (1) above. (5) Due to the significant delay in updating its software, the USPTO is providing an optional procedure for patentees to request PTA recalculation without a fee as an alternative to Rule 1.705(b). The optional procedure is only available for patents issuing between January 14, 2013 and May 20, 2014 directly from international applications. The request must be filed no later than July 31, 2014, and a request form PTO/SB/132 is available on the USPTO website. For purposes of the optional procedure, the USPTO has sua sponte waived the Rule 1.705(b) deadline and fee. Thus, even for some patents where the reconsideration request deadline has already passed, correction under the optional procedure may still be available. If the PTA redetermination results in the PTA requested by the applicant, the USPTO will issue a decision granting the request for reconsideration and a certificate of correction indicating the revised PTA. If the PTA redetermination results in the same PTA as indicated in the patent (i.e., there being no change) and the USPTO does not require any additional information to render a decision on the request for reconsideration, the USPTO will issue a decision denying the request for reconsideration, and this decision is the Director’s decision on the applicant’s request for reconsideration within the meaning of 35 USC 154(b)(4). If the PTA redetermination results in a different PTA (higher or lower than the PTA indicated in the patent), the USPTO will issue a redetermination of PTA explaining how the USPTO arrived at the different PTA. This redetermination of PTA is not the Director’s decision on the applicant’s request for reconsideration within the meaning of 35 USC 154(b)(4), but is simply a new PTA determination. If the USPTO issues such a redetermination of PTA in response to the request for reconsideration of the PTA, the applicant has two months from the date of the redetermination of PTA to file a renewed request for reconsideration of the PTA (no additional fee required) that addresses the issues included in the USPTO’s redetermination of PTA. This two-month period is extendable under § 1.136(a). If the PTA redetermination results in the same PTA as indicated in the patent (i.e., there being no change) but the USPTO requires additional information to render a decision on the request for reconsideration of the PTA, the USPTO will issue a requirement for information to obtain the additional information. This requirement for information is not the Director’s decision on the applicant’s request for reconsideration within the meaning of 35 USC 154(b)(4). If the USPTO issues a requirement for information in response to the request for reconsideration of the PTA, the applicant has two months from the date of the requirement for information to file a renewed request for reconsideration of the PTA supplying the required information (no additional fee required). This two-month period is extendable under § 1.136(a). The USPTO will again conduct a redetermination of PTA in response to any renewed request for reconsideration in response to a redetermination of PTA or in response to a requirement for information. If this redetermination of PTA results in the PTA requested by the applicant, the USPTO will issue a decision granting the request for reconsideration and a certificate of correction indicating the revised PTA. If this redetermination of PTA results in the same PTA as indicated in the previous redetermination of PTA or in the patent, the USPTO will issue a decision denying the request for reconsideration (unless it is necessary to issue another redetermination of PTA or requirement for information) and a certificate of correction if necessary indicating the revised PTA as the result of a redetermination of PTA, and the decision denying the request for reconsideration is the Director’s decision on the applicant’s request for reconsideration within the meaning of 35 USC 154(b)(4). (7) The USPTO reiterated its view that, under section 1(h) of the AIA Technical Corrections Act, a patentee must first seek PTA reconsideration in the USPTO under 35 USC 154(b)(3) prior to filing a civil action under 35 USC 154(b)(4)(A). See 79 FR at 27756 ("(1) A civil action under 35 USC 154(b)(4) is not an alternative to requesting reconsideration of a patent term adjustment under 35 USC 154(b)(3), but instead is the remedy for an applicant who is dissatisfied with the Director’s decision on the applicant’s request for reconsideration; and (2) a civil action under 35 USC 154(b)(4) is the exclusive remedy for an applicant who is dissatisfied with the Director’s decision on the applicant’s request for reconsideration."). (8) The USPTO has not yet modified its PTA calculation software per Novartis AG v. Lee, 740 F.3d 593 (Fed. Cir. 2014) (exclusion of RCE's from B-Delay), but is now beginning to manually process pending requests for reconsideration of PTA under Novartis. The USPTO is not adopting a special ad hoc procedure for patentees to request Novartis correction. Thus, patentees should seek PTA reconsideration per Rule 1.705(b) within two months from the issue date, extendable by an additional five months pursuant to Rule 1.136(a). April 09, 2014: USPTO Revises MPEP Chapter 2700 on Patent Terms and Extensions The recently released MPEP edition, E9R-11.2013 (March 2014), includes a substantially revised Chapter 2700 on Patent Terms and Extensions. Most AIPA PTA-related revisions, however, are just reiterations of the numerous statutory and regulatory developments since the chapter's last update in May 2004. The chapter now incorporates the Wyeth holding (USPTO delays overlap only if occurring on the same calendar day) and the ArQule decision (3-month 1.704(b) applicant response deadline is extended for weekends and federal holidays within the District of Columbia), but it does not reference the recent Novartis decision (exclusion of RCE's from B-Delay). If a registered practitioner receives a patent term adjustment indicated on the front of the patent that is longer than expected, the practitioner may disclose the error to the Office in a letter in compliance with the practitioner’s duty of candor and good faith in practice before the Office. The Office will treat letters submitted by patentees stating that Office’s determination of patent term adjustment indicated on the patent is greater than what the applicant or patentee believes is appropriate by placing these letters in the file of the patent without comment. The Office will not review these letters or issue certificates of correction under either 35 USC 254 or 255 on the of these letters. In addition, the Office will not grant a request for a certificate of correction under either 35 USC 254 or 255 to revise the patent term adjustment indicated in a patent, unless the certificate of correction is issued to revised the patent for consistency with (1) the patent term adjustment determined via a decision on the request for reconsideration under 37 CFR 1.705; or (2) the total patent term adjustment indicated on the Patent Application Information Retrieval (PAIR) screen that displays the patent term adjustment calculation for the patent. If patentee submits a request for a certificate of correction under either 35 USC 254 or 255 to revise the patent term adjustment indicated in a patent that also includes changes in the patent for which a certificate of correction would be appropriate, the request for a certificate of correction will not be granted unless the patentee submits a new request for a certificate of correction that does not also attempt to revise the patent term adjustment indicated in the patent. If patentee wants the Office to reconsider its patent term adjustment determination, the patentee must use the procedures set forth in 37 CFR 1.705 for requesting reconsideration of a patent term adjustment determination. Specifically, the procedures set forth in 37 CFR 1.705 must be used whether the USPTO’s patent term adjustment determination is greater than or less than the adjustment that the applicant or patentee believes to be appropriate. A patentee may also file a terminal disclaimer at anytime disclaiming any period considered in excess of the appropriate patent term adjustment. See 35 USC 253 and 37 CFR 1.321. Note that the Office does not require patentee to file either a request for reconsideration under 37 CFR 1.705 or a terminal disclaimer when the patent term adjustment indicated on the patent is greater than what the patentee believes is appropriate. As discussed above, the patentee or the appointed registered practitioner may disclose the alleged error to the Office in a letter in compliance with the practitioner’s duty of candor and good faith. This language provides a clearer indication of a USPTO view that (1) a Duty of Candor and Good Faith Letter is an acceptable disclosure; and (2) the disclosure letter may be filed after the patent issues (since it references the PTA indicated on the patent). Nonetheless, if a patentee wants the USPTO to actually reconsider its PTA determination on the merits and make a correction, rather than just place the disclosure letter in the file without comment, the patentee must seek reconsideration under Rule 1.705. [T]he patent term adjustment indicated on the patent is the“official” notification of the Office’s patent term adjustment determination under 35 USC 154(b). Accordingly, patentee should wait until the grant of the patent to determine whether or not a request for reconsideration of the patent term adjustment indicated on the patent is warranted. Note, however, one uncommon exception. If an applicant needs to seek reinstatement of PTA where, in spite of all due care, it was unable to respond within 3 months (e.g., more time is necessary to obtain test data for an affidavit or declaration), the request must be filed prior to issuance. See 35 USC 154(b)(3)(C); 37 CFR 1.705(c). The above highlights are general in nature. Please see the USPTO's summary of changes and revised Chapter 2700 for complete details. If you have questions, please contact us via e-mail to Support@PatentTerm.com. March 28, 2014: The USPTO has released a new MPEP edition, E9R-11.2013 (March 2014), including a substantially revised Chapter 2700 on Patent Terms and Extensions. The USPTO's summary of changes to Chapter 2700 is available here. We are currently reviewing revised Chapter 2700 and will provide additional information on this page. Please check back. In the meantime, if you need assistance or have questions, please contact us via e-mail to Support@PatentTerm.com. [T]he PTA Statute unambiguously applies to only one patent application--providing PTA only for delays that occurred during the prosecution of the application from which the patent issued. Alternatively, the Court holds that to the extent that the language of section 154(b)(1)(A) is ambiguous, the USPTO's longstanding interpretation of the statute, as manifested in 37 CFR §§ 1.702, 1.703, and 1.704(c)(12), is reasonable and entitled to some deference. Of course, a continuing application is still entitled to its own PTA based on events occurring during its own examination. See Id. at 23. This ruling is consistent with how the USPTO, and most applicants, typically calculate PTA. See the district court opinion for complete details. January 23, 2014: We have updated our calculator to allow users to readily apply the Novartis holding (see case description below) in PTA calculations. Please logon to your account for details. If you need assistance or have questions, please contact us via e-mail to Support@PatentTerm.com. January 15, 2014: [Updated] There has been a significant development in PTA law. Today, in Novartis AG v. Lee, 2013-1160 (Fed. Cir. 2014), the US Court of Appeals for the Federal Circuit partially adopted and partially rejected the USPTO's long-standing interpretation of how a Request for Continued Examination (RCE) affects the USPTO's obligation to issue a patent within three years under 35 USC 154(b)(1)(B) (commonly known as B-Delay). The ruling resolves conflicts between district court decisions in Novartis, Exelixis I, Exelixis II, and Abraxis. [PTA] time should be calculated by determining the length of the time between application and patent issuance, then subtracting any continued examination time (and other time identified in (i), (ii), and (iii) of (b)(1)(B)) and determining the extent to which the result exceeds three years. Such a reading ensures that applicants recover for any “delay[s] due to the failure of the [PTO]," without allowing the applicant to recover for "any time consumed by continued examination," as the statute requires. Id. § 154(b)(1)(B)(i). [T]ime spent in a continued examination does not deplete the PTO’s allotment of three years for application processing before a resulting patent has its term extended, no matter when the continued examination begins. Thus, under Novartis, an applicant cannot avoid a B-Delay exclusion by merely waiting more than three years to file an RCE. [T]he PTO contends that any time up until the patent issues, even after allowance, should be excluded from the adjustment awarded to the patentee. We reject the PTO’s view that the time after allowance, until issuance, is “time consumed by continued examination” and so is excluded from adjustments given to the patentee. The language of "examination" used in § 154(b)(1)(B) ... presumptively ends at allowance, when prosecution is closed and there is no further examination on the merits in the absence of a special reopening.... The common-sense understanding of "time consumed by continued examination," 35 USC § 154(b)(1)(B)(i), is time up to allowance, but not later, unless examination on the merits resumes. Another aspect of the Novartis decision concerns the 180-day deadline to file a civil action seeking PTA correction per 35 USC 154(b)(4) (2011 version). For a number of patents, Novartis attempted to avoid the deadline arguing, inter alia, (i) the deadline was inapplicable, (ii) the deadline was equitably tolled, and (iii) correction was available under the Takings Clause of the Fifth Amendment. The Court rejected each argument, but acknowledged one exception stating "[i]t is undisputed in this court that the 180-day clock does not run while the PTO considers a timely request for reconsideration under regulations promulgated pursuant to § (b)(3)(B)(ii)'s guarantee of "one opportunity to request reconsideration of any patent term adjustment determination made by the Director."" Slip Op. at 9. Although not in effect in Novartis, note that 35 USC 154(b)(4)(A) was substantially revised in January 2013. For patents for which the revised statute applies, before filing a civil action, an applicant must arguably first request PTA reconsideration in the USPTO, and the 180-day deadline runs from the USPTO's decision on the request. The Novartis decision will increase PTA for tens of thousands of issuing patents where an RCE was filed during prosecution, since PTA for USPTO B-Delay is now potentially available for the period after allowance (on average about four months). Be aware that the current USPTO PTA algorithm incorrectly extends the RCE exclusion until issuance. See 37 CFR 1.703(b)(1). To benefit from Novartis, applicants are advised to recheck PTA in patents where (i) the application was pending at least three years; and (ii) an RCE was filed (whether the RCE was filed before or after three years does not matter). Under the current version of 37 CFR 1.705, the deadline to seek PTA reconsideration in the USPTO is two months from the issue date, extendable by an additional five months pursuant to Rule 1.136(a). Under the current version of 35 USC 154(b)(4)(A), the deadline to file a civil action is within 180 days after the date of the Director's decision on the applicant's request for reconsideration. The above description is general in nature, and the PTA effect in an individual patent will depend on the specifics of its prosecution. Please see the opinion and legal authorities for complete details. We are working on updates to easily apply the Novartis holding in PTA calculations using our calculator. In the meantime, if you need assistance or have questions, please contact us via e-mail to Support@PatentTerm.com. December 18, 2013: A new PTA reduction goes into effect today, wherein failing to provide an application in "condition for examination" within eight months from the filing or national stage commencement date constitutes applicant delay under 37 CFR 1.704(c)(12). See 78 FR 62368 (Oct. 21, 2013) and our post below for details. The new reduction applies only to patent applications filed under 35 USC 111 on or after December 18, 2013, and international patent applications in which the national stage commenced under 35 USC 371 on or after December 18, 2013. We have added a corresponding rule to our PTA calculator allowing users to perform a calculation in accordance with this new requirement. If you need assistance or have questions about how to apply the new rule, please contact us via e-mail to Support@PatentTerm.com. These cases address, inter alia, a common substantive legal issue, the PTA effect of the filing of a Request for Continued Examination after the three-year anniversary of the filing of a patent application. See below for more information on this important legal issue. The timeliness of seeking judicial review of USPTO-calculated PTA is also at issue for some of the patents involved. A recording of the oral argument is available on the Federal Circuit website. We estimate a ruling will be issued in the first quarter of 2014.
any application size fee required by the Office under § 1.16(s). any application size fee required by the Office under § 1.492(j). An application shall be considered as having papers in compliance with § 1.52, drawings (if any) in compliance with § 1.84, and a sequence listing in compliance with § 1.821 through § 1.825 (if applicable) for purposes of this paragraph on the filing date of the latest reply (if any) correcting the papers, drawings, or sequence listing that is prior to the date of mailing of either an action under 35 U.S.C. 132 or a notice of allowance under 35 U.S.C. 151, whichever occurs first. 78 FR at 62408 (line breaks and bullets added). In response to comments on the proposed rule, the Final Rule clarifies that, apparently, corrections to application papers, drawings, and sequence listings after a first Office action (or notice of allowance) will not generate a PTA reduction under the new rule. See 78 FR at 62390 ("Thus, the patent term adjustment reduction provision of § 1.704(c)(12) would not apply to a correction of the application papers, drawings, or sequence listing that is required by an examiner (i.e., would not apply to corrections that take place after the date of mailing of either an action under 35 U.S.C. 132 or a notice of allowance under 35 U.S.C. 151)."). Note, however, that the USPTO commentary is somewhat different than the actual language of paragraph 1.704(f) ("An application shall be considered as having papers in compliance with § 1.52, drawings (if any) in compliance with § 1.84, and a sequence listing in compliance with § 1.821 through § 1.825 (if applicable) for purposes of this paragraph on the filing date of the latest reply (if any) correcting the papers, drawings, or sequence listing that is prior to the date of mailing of either an action under 35 U.S.C. 132 or a notice of allowance under 35 U.S.C. 151, whichever occurs first."). Accordingly, in some circumstances, it is possible there will be uncertainty on this point. The effective date of the Final Rule is December 18, 2013. The new PTA reduction under 37 CFR 1.704 applies only to patent applications filed under 35 USC 111 on or after December 18, 2013, and international patent applications in which the national stage commenced under 35 USC 371 on or after December 18, 2013. See the Final Rule for complete details. We are currently reviewing the Final Rule and will add a corresponding rule to our PTA calculator prior to the effective date. Please check back. If you need assistance or have questions, please contact us via e-mail to Support@PatentTerm.com. the USPTO's failure to correct the applicant's PTA was a "taking" of property without due process or just compensation in violation of the Fifth Amendment of the Constitution. The Court rejected each theory and held that the 180-day time limit for seeking judicial review is in fact jurisdictional. Thus, because the applicant filed suit after the deadline, its statutory claim under 154(b)(4)(A) was untimely and the Court lacked subject matter jurisdiction to hear the claim. The Court also noted that general tolling, as applied in Bristol-Myers Squibb Co. v. Kappos, 841 F.Supp.2d 238 (D.D.C. 2012), did not apply in this case since the applicant never sought administrative reconsideration of the PTA. See the district court opinion for complete details. October 09, 2013: In Gilead Sciences, Inc. v. Rea, 1:12-cv-1090 (E.D. Va. 2013), the US District Court for the Eastern District of Virginia upheld the USPTO's long-standing position that an information disclosure statement, filed after a reply to a restriction requirement, and without a safe harbor statement under 37 CFR 1.704(d), constitutes applicant delay generating a PTA reduction under 37 CFR 1.704(c)(8) ("supplemental reply or other paper"). These cases address, inter alia, a common substantive legal issue, the PTA effect of the filing of a Request for Continued Examination after the three-year anniversary of the filing of a patent application. See below for more information on this important legal issue. (11) Failure to provide an application in condition for examination as defined in paragraph (f) of this section within eight months from either the date on which the application was filed under 35 U.S.C. 111(a) or the date of commencement of the national stage under 35 U.S.C. 371(b) or (f) in an international application, in which case the period of adjustment set forth in § 1.703 shall be reduced by the number of days, if any, beginning on the day after the date that is eight months from either the date on which the application was filed under 35 U.S.C. 111(a) or the date of commencement of the national stage under 35 U.S.C. 371(b) or (f) in an international application and ending on the date the application is in condition for examination as defined in paragraph (f) of this section. (f) An application filed under 35 U.S.C. 111(a) is in condition for examination when the application includes a specification, including at least one claim and an abstract (§ 1.72(b)), and has papers in compliance with § 1.52, drawings (if any) in compliance with § 1.84, any English translation required by § 1.52(d) or § 1.57(a), a sequence listing in compliance with § 1.821 through § 1.825 (if applicable), the inventor’s oath or declaration or application data sheet containing the information specified in § 1.63(b), the basic filing fee (§ 1.16(a) or § 1.16(c)), any certified copy of the previously filed application required by § 1.57(a), and any application size fee required by the Office under § 1.16(s). An international application is in condition for examination when the application has entered the national stage as defined in § 1.491(b), and includes a specification, including at least one claim and an abstract (§ 1.72(b)), and has papers in compliance with § 1.52, drawings (if any) in compliance with § 1.84, a sequence listing in compliance with § 1.821 through § 1.825 (if applicable), the inventor’s oath or declaration or application data sheet containing the information specified in § 1.63(b), and any application size fee required by the Office under § 1.492(j). Written comments concerning this proposed change must be received by June 10, 2013. See Changes to Implement the Patent Law Treaty, 78 FR 21788 (Apr. 11, 2013) for details. (1) For patents granted on or after January 14, 2013 on US national stage applications under 35 USC 371, the USPTO 14-month first action requirement under 35 USC 154(b)(1)(A)(i)(II) has been changed. Under revised Rules 1.702(a)(1) and 1.703(a)(1), the USPTO must now issue a first action within 14 months of commencement of the national stage under section 371(b) or (f), rather than upon fulfillment of the 371 requirements. Since the USPTO's 14-month deadline will start earlier in some national stage applications, this change is beneficial to applicants and may substantially increase PTA in some national stage cases. (2) For patents granted on or after January 14, 2013, the PTA indicated on the patent itself is the USPTO's "official" notification of its PTA determination, and is now the only determination for which an applicant may seek reconsideration under revised Rule 1.705. The deadline to seek such reconsideration is two months from the issue date, extendable by an additional five months pursuant to Rule 1.136(a). The notion of a request for reconsideration of PTA indicated in the notice of allowance has been eliminated. This unitary system will simplify the process of reviewing and petitioning for correction of USPTO-calculated PTA. (3) In its commentary on the Act's revision of 35 USC 154(b)(4)(A), the USPTO set forth its view than an applicant must first seek PTA reconsideration in the USPTO under 35 USC 154(b)(3) prior to filing a civil action under 35 USC 154(b)(4)(A). See 78 FR at 19417 ("A civil action under 35 USC 154(b)(4)(A) is not an alternative to requesting reconsideration of a patent term adjustment under 35 USC 154(b)(3), but is the [exclusive] remedy for an applicant who is dissatisfied with the Director’s decision on the applicant’s request for reconsideration ...."). The USPTO apparently believes this limitation is only effective for patents granted on or after January 14, 2013, see id. at 19418, but it seems possible courts will apply this limitation to all 154(b)(4)(A) civil actions filed on or after January 14, 2013. The effective date of the Interim Final Rule is April 1, 2013. The changes to 37 CFR 1.702, 1.703, and 1.705 apply to patents granted on or after January 14, 2013. The change to 37 CFR 1.704 applies to any application in which a notice of allowance was mailed on or after April 1, 2013. Since the effective date vis-a-vis existing applications and patents is not clearly stated in the AIA Technical Corrections Act, it is possible the USPTO's interpretation of the effective dates set forth above may be the subject of future litigation. Note that the USPTO issued the notice as an Interim Final Rule to allow for public comment by May 31, 2013. Since the revision discussed in item (1) may substantially increase PTA in some national stage cases, applicants are advised to recheck PTA in national stage cases granted as patents on or after January 14, 2013 and seek reconsideration of USPTO-calculated PTA as appropriate. The above description is general in nature, and the PTA effect in an individual patent will depend on the specifics of its prosecution history. Please see the Interim Final Rule and the AIA Technical Corrections Act for complete details of this revision. If you need assistance or have questions, please contact us via e-mail to Support@PatentTerm.com. January 29, 2013: In a second Exelixis case, Exelixis, Inc. v. Kappos, No. 1:12cv574 (E.D. Va. 2013) (“Exelixis II”), Judge Brinkema has rejected Judge Ellis’s holding in Exelixis I, which overturned a long-standing USPTO interpretation concerning the 3-Year Application Pendency Guarantee (also called "B Delay" or the "3-Year Issue Guarantee"). See our prior posts below for an overview of the Exelixis I decision. The Exelixis II case involves the same parties as in Exelixis I, but is a separate civil suit seeking PTA correction on a different patent. Since the USPTO has already appealed the Exelixis I decision, this split within the US District Court for the Eastern District of Virginia will likely be resolved by the US Court of Appeals for the Federal Circuit, perhaps later this year. Until this is resolved, to preserve their rights, applicants and patent holders are advised to recheck USPTO-calculated PTA in light of Exelixis I, seeking reconsideration under 37 CFR 1.705, 35 USC 154(b)(4)(A), and other mechanisms as appropriate. Importantly, in considering options for PTA correction, as noted below, HR 6621 signed into law on January 14, 2013, arguably mandates that applicants first seek reconsideration in the USPTO prior to filing a civil action under 35 USC 154(b)(4)(A). (1) The Act revises the USPTO 14-month first action requirement under 35 USC 154(b)(1)(A)(i)(II) for national stage cases. Under the revised provision, the USPTO must issue a first action within 14 months of commencement of the national stage under section 371, rather than upon fulfillment of the 371 requirements. Since the USPTO's 14-month deadline will start earlier in some national stage applications, this change is beneficial to applicants and may substantially increase PTA in some national stage cases. (2) The Act clarifies that the USPTO's 3-year issue deadline under 35 USC 154(b)(1)(B) ("B Delay") begins on "the actual filing date of the application under section 111(a) in the United States or, in the case of an international application, the date of commencement of the national stage under section 371 in the international application." This clarification is seemingly consistent with current USPTO practice in calculating PTA. (3) The Act allows the USPTO to provide its PTA determination at issuance. Under the current bifurcated system, the USPTO provides both a preliminary determination at allowance and a final determination at issuance, each of which must be separately audited by the applicant. See 37 CFR 1.705(b) and (d). Once implemented by the USPTO via regulatory changes, a unitary system will simplify the process of reviewing and petitioning for correction of USPTO-calculated PTA. An applicant dissatisfied with the Director’s decision on the applicant’s request for reconsideration under paragraph (3)(B)(ii) shall have exclusive remedy by a civil action against the Director filed in the United States District Court for the Eastern District of Virginia within 180 days after the date of the Director’s decision on the applicant’s request for reconsideration. 35 USC 154(b)(4)(A) (emphasis added). The reference to a "request for reconsideration" (e.g., a petition under 37 CFR 1.705) has been added, arguably mandating that an applicant must first seek PTA reconsideration in the USPTO prior to filing a civil action. For existing patents where no request for reconsideration was filed, the USPTO may argue that a civil remedy is not available. The 180-day deadline begins upon the "Director’s decision on the applicant’s request for reconsideration" instead of the issue date, providing some applicants additional time to file a civil action. For applications where the Director's decision comes before issuance, however, less than 180 days from issuance may be available. This revision seems to partially adopt the tolling rule applied in several recent decisions. See, e.g., Bristol-Myers Squibb Co. v. Kappos, 841 F. Supp.2d 238, motion for reconsideration denied, 2012 WL 4127636 (D.D.C. Sept. 20, 2012). The 35 USC 154(b)(4)(A) remedy is "exclusive," arguably precluding other legal theories under which applicants might seek PTA correction. See, e.g., Novartis AG v. Kappos, Civil Action No. 10-cv-1138 (Nov. 15, 2012). The effective date of the above revisions vis-a-vis existing applications and patents is not completely clear and will likely be the subject of litigation. Per the Act, the amendments take effect upon enactment and "shall apply to proceedings commenced on or after such date of enactment." Thus, if the prosecution of a patent application is a "proceeding" that is "commenced" upon filing (or, in a national stage application, upon commencement of the national stage under 35 USC 371), arguably only new patent applications are affected by items (1) to (3) discussed above. Alternatively, perhaps applicants will argue that a 37 CFR 1.705 request for reconsideration, or a civil action under 35 USC 154(b)(4)(A), is a "proceeding," in an attempt to apply item (1) retroactively. For item (4), however, if a civil action under 35 USC 154(b)(4)(A) is a "proceeding" that is "commenced" upon filing a complaint, all prospective civil suits, even those concerning existing patents, may arguably be subject to the revision. The above description is general in nature, and the PTA effect in an individual patent will depend on the specifics of its prosecution history. Please see the Act for complete details. If you need assistance or have questions, please contact us via e-mail to Support@PatentTerm.com. January 02, 2013: The USPTO has appealed the ruling in Exelixis, Inc. v. Kappos, No. 1:12cv96, __ F.Supp.2d __ (E.D. Va. 2012) to the United States Court of Appeals for the Federal Circuit. While the appeal is pending, to preserve their rights, applicants and patent owners are strongly advised to recheck USPTO-calculated PTA in light of Exelixis, seeking correction under 37 CFR 1.705, 35 USC 154(b)(4)(A), and other mechanisms as appropriate. Please see our prior posts for more information about Exelixis. November 12, 2012: The US District Court for the Eastern District of Virginia has overturned a long-standing USPTO interpretation concerning the 3-Year Application Pendency Guarantee (also called "B Delay" or the "3-Year Issue Guarantee") of the American Inventor’s Protection Act ("AIPA"), codified at 35 USC 154(b)(1)(B). See Exelixis, Inc. v. Kappos, No. 1:12cv96 (E.D. Va. 2012). If it stands, this ruling will ensure many more diligent applicants receive a patent term of 17 years or more, as is intended by AIPA's 3-Year Issue Guarantee. One of the patent term guarantees provided by AIPA is that an application must issue within a maximum of three years from filing, or else a day-for-day term extension is made as one component of Patent Term Adjustment ("PTA"). See 35 USC 154(b)(1)(B). Determining how the end of the 3-year issue deadline operates to benefit applicants, however, is not just a simple matter of adding three years to the filing date. Excluded from the 3-year period are specified "tolling events" (also known as "exclusions"), namely (1) time consumed by RCE's; (2) time consumed by interference proceedings, secrecy orders, or appellate review; and (3) delay in USPTO processing requested by the applicant. See 35 USC 154(b)(1)(B)(i)-(iii). At issue in Exelixis is the effect on B Delay of a tolling event, the filing of an RCE, occurring after the 3-year issue deadline has already passed--in other words, after B Delay has already begun to accrue. The long-standing USPTO position is that an RCE always cuts off any subsequent B Delay, even if filed after the end of the 3-year issue deadline. In some long, complex prosecutions with one or more RCE's, this means a relatively small PTA contribution from the 3-Year Issue Guarantee (B Delay), despite the fact that issuance may take a great deal longer than three years. [P]ut simply, RCE's have no impact on PTA if filed after the three year deadline has passed. Exelixis, Slip Op. at 16 (emphasis added). Thus, under the USPTO interpretation, B Delay begins at Year 3, and stops when the RCE is filed at Year 4. Accordingly, only 1 year of PTA accrues. The resulting patent term is 14 years (a 13 year base term plus 1 year of PTA). Thus, under Exelixis, B Delay begins at Year 3, and continues until issuance at Year 7. Accordingly, 4 years of PTA accrues. This results in a full 17 year patent term (same 13 year base term plus 4 years of PTA). When prosecuting applications, practitioners are advised to carefully consider the timing of tolling events (e.g., an RCE or appeal) vis-a-vis the effective end of the 3-year period in 35 USC 154(b)(1)(B) since, under Exelixis, a few days difference can have a major impact on the term of a resulting patent. For example, a first RCE filed at two years and eleven months from the application filing date acts to toll the 3-year issue deadline, whereas the same RCE filed at three years and a day (or, if other tolling events exist, after whatever date effectively ends the 3-year deadline) has no impact on B Delay. In other words, from an applicant perspective, it is now even more important that B Delay actually begins since, under Exelixis, once started it will run continuously until issuance, providing very significant term protection against further prosecution delays. For existing applications and patents, applicants and patent owners are advised to recheck USPTO-calculated PTA in light of Exelixis, seeking correction under 37 CFR 1.705, 35 USC 154(b)(4)(A), and other mechanisms as appropriate. We believe it is likely the USPTO will appeal the Exelixis decision, so its full impact may not be known for some time. The USPTO may also seek to define the filing of some or all RCE's as applicant delay per 35 USC 154(b)(2)(C)(iii) (i.e., a circumstance that constitutes a failure of an applicant to engage in reasonable efforts to conclude processing or examination of an application), although such a characterization may be farfetched. And, any new USPTO interpretation or regulation seeking to limit Exelixis would likely be complex to account for overlaps with other USPTO and applicant delays. The above description is general in nature, and the PTA effect in an individual patent will depend on the specifics of its prosecution history. Please see the Exelixis decision for complete details. If you need assistance or have questions about performing a PTA calculation in accordance with Exelixis, please contact us via e-mail to Support@PatentTerm.com. (1) PTA Credit for Successful Appellate Review. Under 35 USC 154(b)(1)(C)(iii), applicants receive PTA for the pendency of appellate review, by the Board or a Federal court, if the appeal is successful (i.e., patent issues under a decision reversing an adverse determination of patentability). By this rule change, the USPTO has redefined the pendency of an appeal to start when jurisdiction passes to the Board, instead of upon the filing of a notice of appeal by the applicant. Compare pre-revision 37 CFR 1.703(e) with post-revision 37 CFR 1.703(e). (2) Exclusion for Appellate Review. Under 35 USC 154(b)(1)(B)(ii), any time consumed by appellate review, by the Board or a Federal court, is not included in determining if the USPTO failed to issue a patent within 3 years under 35 USC 154(b)(1)(B). For this exclusion, the USPTO has redefined the time consumed by an appeal to start when jurisdiction passes to the Board, instead of upon the filing a notice of appeal by the applicant. Compare pre-revision 37 CFR 1.703(b)(4) with post-revision 37 CFR 1.703(b)(4). Accordingly, if jurisdiction does not pass to the Board (e.g., examiner issues a new Office action or allowance before briefing), there is no exclusion under 35 USC 154(b)(1)(B)(ii). (3) 3-Month Applicant Deadline to File Appeal Brief. The USPTO has established a new PTA rule requiring applicants to file a compliant appeal brief or RCE within 3 months of filing a notice of appeal. If this time limit is exceeded, it is considered applicant delay, and PTA credits are reduced. See revised 37 CFR 1.704(c)(11). The Final Rule is effective September 17, 2012. Changes to Rule 1.703 apply to any application in which a notice of allowance is issued on or after September 17, 2012, and any patent issuing thereon. The change to Rule 1.704 applies with respect to the filing of an appeal brief in any application in which a notice of appeal under 37 CFR 41.31 is filed on or after September 17, 2012. In addition, the USPTO will also apply the changes to Rule 1.703 in any timely PTA reconsideration proceeding initiated on or after September 17, 2012. To allow patentees to take advantage of the rule change to potentially increase PTA, the Notice suggests several avenues to seek reconsideration, including filing a request for reconsideration within two months of a USPTO PTA decision under 37 CFR 1.705(d). The above description is general in nature, and the PTA effect in an individual patent will depend on the specifics of its prosecution history. Please see the Final Rule for complete details of this revision. If you need assistance or have questions, please contact us via e-mail to Support@PatentTerm.com. December 04, 2011: The USPTO has issued a Final Rule expanding the 37 CFR 1.704(d) safe harbor provision exempting certain Information Disclosure Statement (IDS) filings from PTA reduction under 37 CFR 1.704(c)(6), (8), (9), or (10). This change will increase patent term for many patentees, especially in complex cases where applicants are required to file numerous IDS's disclosing actions or references in related applications. To benefit, however, applicants will need to file IDS's within 30 days of pertinent US, foreign, or international office communications. (1) items first cited in any communication from a patent office in a counterpart foreign or international application or from the USPTO. Previously, only items from communications from a foreign patent office in a counterpart application were explicitly covered. (2) communications issued by a patent office in a counterpart foreign or international application or by the USPTO. Previously, only items cited in communications, as opposed to communications themselves, were explicitly covered. As before, an exempted paper must contain only a compliant IDS, and must be accompanied by the required statement that, inter alia, pertinent communications were not received by any individual designated in § 1.56(c) more than 30 days prior to the IDS filing. See 37 CFR 1.704(d) for complete requirements. August 23, 2011: We have added an option to analyze the 3-Month Applicant Response rule under ArQule, Inc. v. Kappos, No. 10-1904 (D.D.C. 2011). For important information concerning this update, please see the Announcements when you logon to your account, or click the Arqule v. Kappos link, which appears under each occurrence of the 3-Month Applicant Response rule on the Apply Term Rules tab. If you need assistance or have questions concerning this option, please contact us via e-mail to Support@PatentTerm.com. August 08, 2011: On June 23, 2011, the DC District Court overturned the USPTO's long-standing interpretation that, for PTA purposes, weekend and holiday exceptions under 35 USC 21(b) do not apply to the 3-month applicant response deadline under 35 USC 154(b)(2)(C)(ii). See ArQule, Inc. v. Kappos, No. 10-1904 (D.D.C. 2011). In ArQule, a 3-month applicant response deadline fell on Veterans Day, and the applicant filed its response the following day. The district court held that the USPTO’s one day reduction of applicant’s PTA was improper since, under the clear meaning of the statute, the weekend and holiday exception in 35 USC 21(b) does apply when calculating PTA reduction under 35 USC 154(b)(2)(C)(ii). If this ruling stands, it is likely to increase the PTA for thousands of applications, albeit by a small number of days. As of early August, to our knowledge, the USPTO has not yet appealed the DC District Court judgment, nor has the USPTO issued a notice concerning the ruling. Applicants are advised to carefully check USPTO-calculated PTA for consistency with ArQule, taking into account the deadlines for seeking correction under 37 CFR 1.705 and 35 USC 154(b)(4). To perform such calculations using the PatentTerm Online calculator, where a weekend or holiday affects PTA under the 3-month applicant response deadline, users will need to manually adjust pertinent dates to account for weekends and holidays. Keep in mind that a separate response event may need to be added, since the 35 USC 21(b) exception presumably does not affect the 4-month USPTO deadline to respond to certain applicant papers. See 35 USC 154(b)(1)(A)(ii); 37 CFR 1.702(a)(2), 1.703(a)(2),(3). If you need assistance or have questions, please contact us via e-mail to Support@PatentTerm.com. In the next few weeks, PatentTerm Online will implement an update allowing a more automated solution addressing this issue. This PAIR system update was outlined in the Federal Register Notice of February 1, 2010, and an explanation by the USPTO is available here. July 21, 2010: The USPTO has issued a Federal Register Notice indicating it will no longer review Duty of Candor and Good Faith Letters. Instead, such letters will simply be placed in the file wrapper without further review, and certificates of correction will not be issued based on such letters. Historically, applicants have used Duty of Candor and Good Faith Letters to disclose where the USPTO has granted PTA greater than what the applicant believes is appropriate. The USPTO would typically review its PTA calculation in light of such letters and make corrections as warranted. Now, even where the USPTO errs in granting excessive PTA, the applicant must use the procedures in 37 CFR 1.705 to obtain USPTO reconsideration of a PTA determination. This includes satisfying the formal requirements and deadlines set forth in Rule 1.705 and paying a $200 fee. Alternatively, a patentee may file a terminal disclaimer disclaiming the period considered in excess of the appropriate PTA, but presumably this will not invoke substantive PTA reconsideration by the USPTO. The USPTO did not provide an opportunity for comments prior to this Notice, and did not explain the effect of unreviewed letters. The USPTO indicated it will revise appropriate MPEP sections accordingly in due course. Please review the Federal Register Notice for details. For older patents, the USPTO does not provide an administrative remedy to recapture PTA deprived under its flawed overlap interpretation overturned in Wyeth. The USPTO's refusal to accord the benefits of Wyeth to older patents is "arbitrary, capricious, an abuse of discretion, or otherwise not in accordance with law and in excess of statutory jurisdiction, authority or limitation." The 180 day deadline set forth in 35 USC 154(b)(4) applies only to PTA determinations made in conjunction with a notice of allowance, not PTA determinations made at issuance. Even if the 35 USC 154(b)(4) deadline applies to Novartis' claims, it is tolled under the common law doctrine of equitable tolling. In that case, the 180 day period would begin on January 7, 2010 (Federal Circuit affirms Wyeth) or January 21, 2010 (USPTO announces it will not appeal Wyeth). The USPTO's "purposeful and deliberate diminution of the patent term ... constitutes a taking of Novartis' property without just compensation, in violation of the Fifth Amendment of the Constitution of the United States." Patentees can request PTA recalculation under Wyeth without a fee or petition. The procedure is only available for patents issued prior to March 2, 2010. A recalculation request must be filed no later than 180 days after the patent issue date. The interim procedure is only available if the sole basis for alleged error is the Wyeth issue. Form PTO/SB/131 has been made available to make the recalculation request. The USPTO has submitted a Federal Register Notice setting forth details. One leading commentator, however, has questioned the USPTO's authority to provide this interim procedure. Prudent applicants are advised to recheck all parts of USPTO-calculated PTA, observing the formal deadlines under 35 USC 154(b)(4) and 37 CFR 1.705 where possible. Otherwise, applicants may have limited recourse to correct erroneous USPTO recalculations, especially if the recalculation is made more than 180 days after issue. January 22, 2010: The USPTO has announced that it, and the Department of Justice, have decided not to seek further review of the Federal Circuit's decision in Wyeth v. Kappos. The USPTO further stated it is preparing guidance for expediting requests for PTA recalculation in light of Wyeth, which will be issued as soon as possible. The USPTO again reminds applicants and patent owners dissatisfied with a USPTO-calculated PTA of "the requirement to seek review of that determination within 180 days of patent issuance and the time periods set in the implementing regulations. See 35 USC sec. 154(b)(4) and 37 CFR 1.705." For patents outside the listed deadlines, perhaps some practitioner will succeed in retroactively obtaining the benefit of Wyeth (e.g., certificate of correction, petition to director, equitable tolling), but that path is less certain. January 12, 2010: While not yet implemented, the USPTO has announced it is in the process of changing its PTA calculation algorithm to conform with Wyeth, pending a determination by the Solicitor General of whether to seek further review of the Federal Circuit holding. Until the change is implemented and tested, Applicants are advised to carefully check USPTO-calculated PTA under Wyeth. The USPTO reminds applicants and patent owners dissatisfied with a USPTO-calculated PTA of "the requirement to seek review of that determination within 180 days of patent issuance and the time periods set in the implementing regulations. See 35 USC 154(b)(4) and 37 CFR 1.705." For patents outside the listed deadlines, perhaps some practitioner will succeed in retroactively obtaining the benefit of Wyeth (e.g., certificate of correction, petition to director, equitable tolling), but that path is less certain. January 12, 2010: PatentTerm Online has issued a press release briefly explaining, in layperson's terms, the history and holding on the issue presented in Wyeth. See Inventors Take Heart: Federal Court Restores Patent Term Guarantees, at Last Protecting Innovators from Patent Office Delays, Noted Professor Says. January 07, 2010: [Updated] Today, the Federal Circuit unanimously affirmed the DC District Court ruling in Wyeth, overturning a USPTO statutory interpretation that resulted in reduced terms for tens of thousands of US patents. This holding, long advocated by the founders of PatentTerm Online, LLC, will result in significantly greater PTA for many patent applications pending more than three years. Click here to download the Wyeth v. Kappos opinion. To learn more about the PTA benefits of Wyeth, please review our updated simplified example. August 24, 2009: [Wyeth Briefing Update] Briefing was completed in Wyeth v. Kappos, No. 09-1120 (Fed. Cir. ), on June 22, 2009. Oral argument has been scheduled for October 7, 2009. June 05, 2009: We have confirmed that the USPTO is rejecting some Applications for PTA requesting additional days under the Wyeth ruling. To seek review of a USPTO PTA determination, applicants must file a civil action in the DC District Court within 180 days after the grant of the patent. See 35 USC 154(b)(4)(A). This deadline may apply even where the USPTO has not acted on a pending PTA petition. November 28, 2008: The USPTO appealed the ruling in Wyeth et al. v. Dudas, 580 F.Supp.2d 138 (D.D.C. 2008). The initial appeal was to the DC Circuit Court, but was subsequently transferred to the Federal Circuit. November 25, 2008: On November 7, 2008, Ironwood Pharmaceuticals filed suit against the USPTO seeking additional PTA under Wyeth. Of note, the applicant proceeded directly to the DC District Court within 180 days of issue under 35 USC 154(b)(4)(A) without first seeking correction in the USPTO under 37 CFR 1.705. October 02, 2008: There has been a significant development in PTA law. On September 30, 2008, the DC District Court overturned the USPTO's interpretation of 35 USC 154(b)(2)(A) (the "Actual Delay" limitation) in Wyeth et al. v. Dudas, 580 F.Supp.2d 138 (D.D.C. 2008). Many patents pending more than three years will be entitled to additional PTA under Wyeth. Please review our simplified example and Wyeth's summary judgment motion to learn more about the PTA benefits of this ruling. For recipients of recently issued patents, the time to seek the benefit of Wyeth may be limited under Rule 1.705 and 35 USC 154(b)(4)(A). See our simplified example for more information. See the Open Letter to Practitioners, identifying this issue at the time the USPTO's interpretation was promulgated. See Professor Kayton's paper, Patent Term Duration and Its Calculation, for a detailed discussion of this issue. Disclaimer: News, articles, commentary, examples, and authorities available here are provided on an "as is" and "as available" basis, are not legal advice, and my contain errors or omissions, or may no longer be correct under current law." Third-party sites will appear in a separate browser window and are not affiliated with PatentTerm Online, LLC. Links to third-party sites are provided solely for your convenience and do not constitute endorsement by PatentTerm Online, LLC.